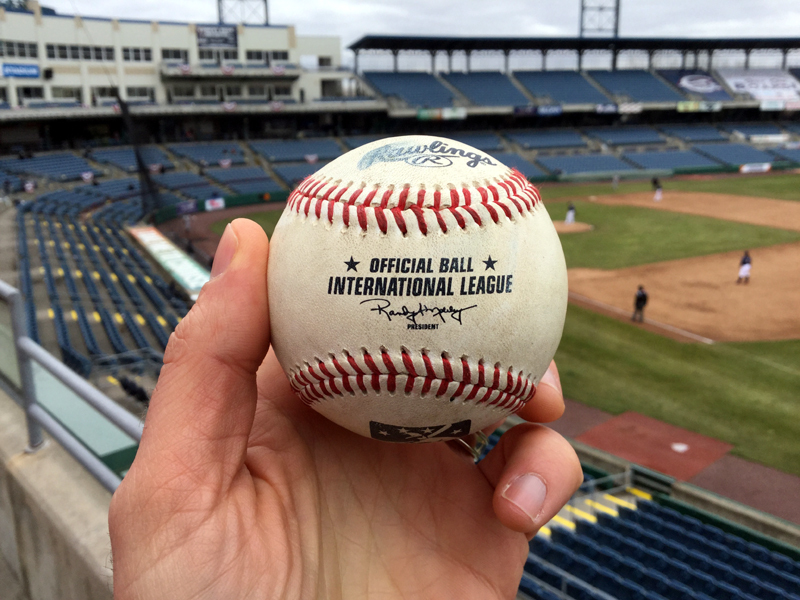 A little more than 12 hours after I’d thawed out following a frigid but fun visit to NBT Bank Stadium in Syracuse, I was back at the International League ballpark for a doubleheader that was set to begin at 10:30 a.m. 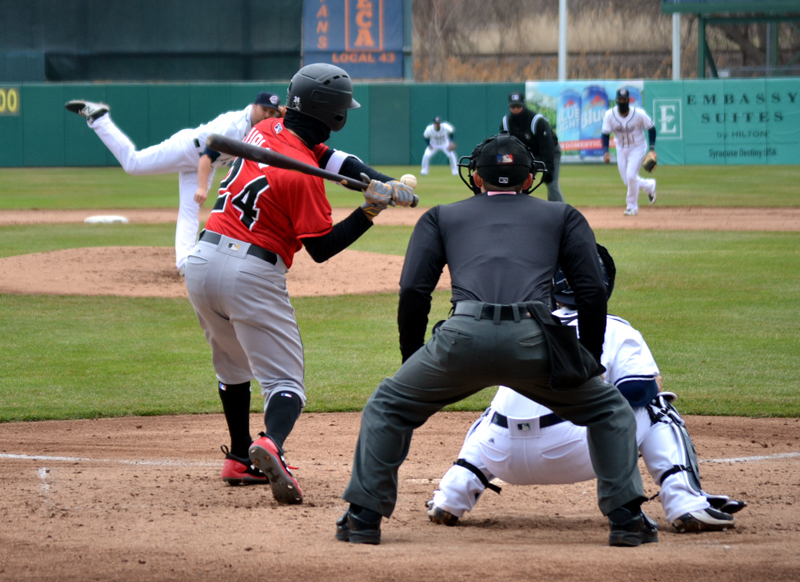 The previous day’s wintry weather had canceled the second game of a scheduled doubleheader, so the teams tacked that game onto the end of the matinee game on this day, and I was thrilled to be able to take in both contests before driving home. 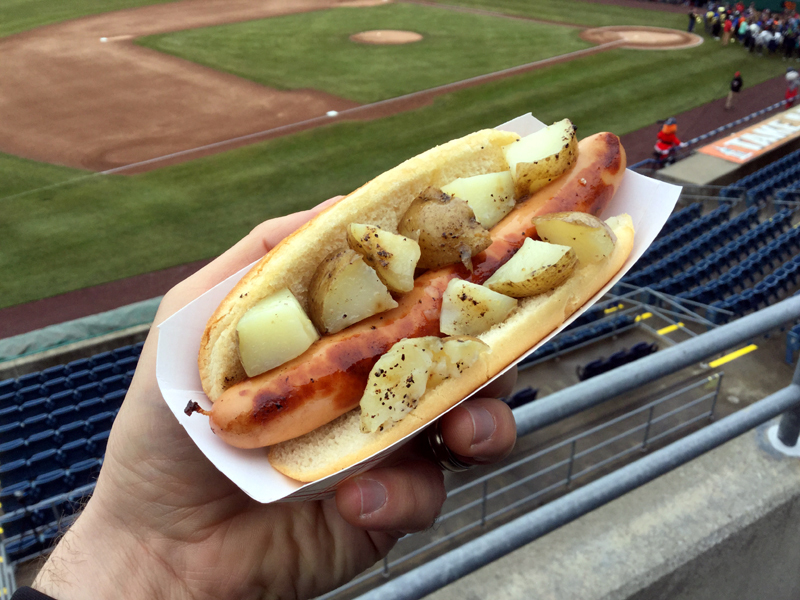 The Hofmann hot dogs served at NBT Bank Stadium are probably my favorite dogs of any ballpark, so the idea of adding potatoes with butter, salt and pepper was a winner. I will say, though, that I think this hot dog could’ve used a little something else in the flavor department. Of course, I could’ve added a flavorful condiment such as mustard, but it felt as though it was a little more bland than I’d have liked. Still, it was a good hot dog overall, and the unique topping of the salt potatoes made it fun to eat. Notice anything unique about him? You might have seen that he’s wearing Seattle Mariners pants, as evidenced by the colors of the MLB logo on the belt tunnel. 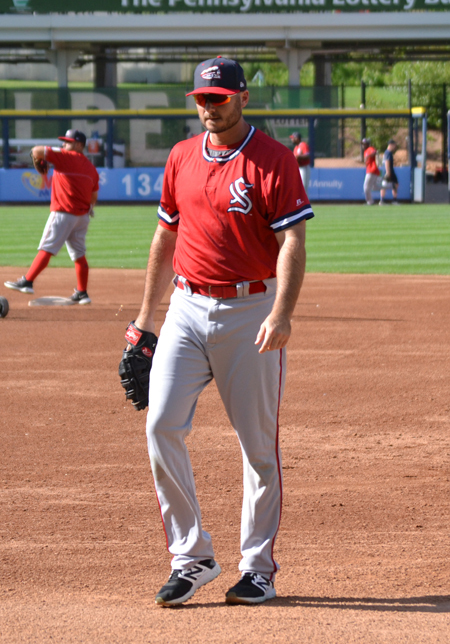 I’ve noticed that a lot of guys who’ve bounced between Triple-A and the big leagues wear their big league pants with their Triple-A jerseys, but I think this is the first time that I’ve seen a mismatch in organizations — the Chiefs are affiliated with the Washington Nationals, not the Mariners. 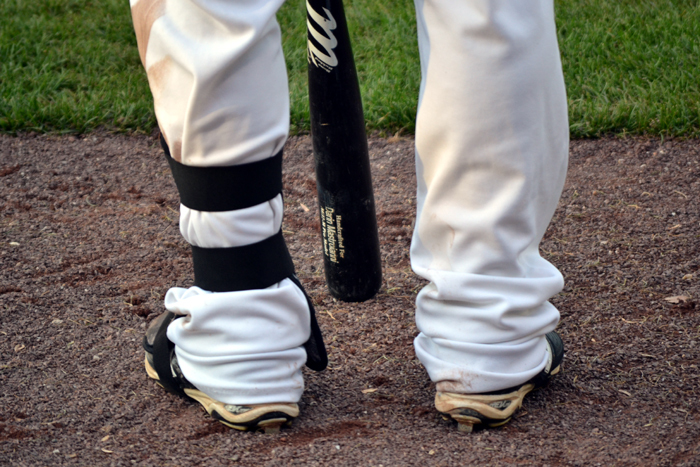 Gosewisch, though, played 11 games for Seattle last season, which explains the pants. 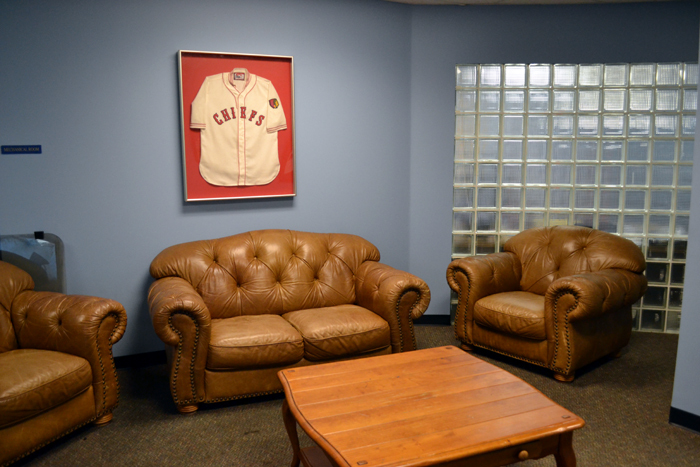 I got some reprieve from the cold conditions by hanging out in the Hank Sauer Room between games of the doubleheader. As had been the case a day earlier, the Chiefs had opened up this room for fans looking for a little warmth, and it was nice to be able to warm up a little as I waited for the second game of the twin bill to begin. 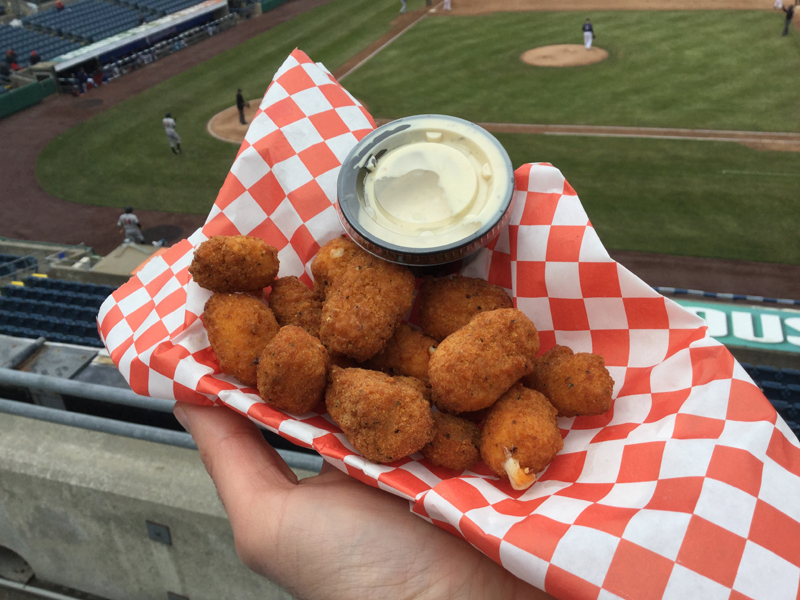 I actually had fried cheese curds at Target Field last fall, and while they were good, I’d give the nod to those I ate in Syracuse. 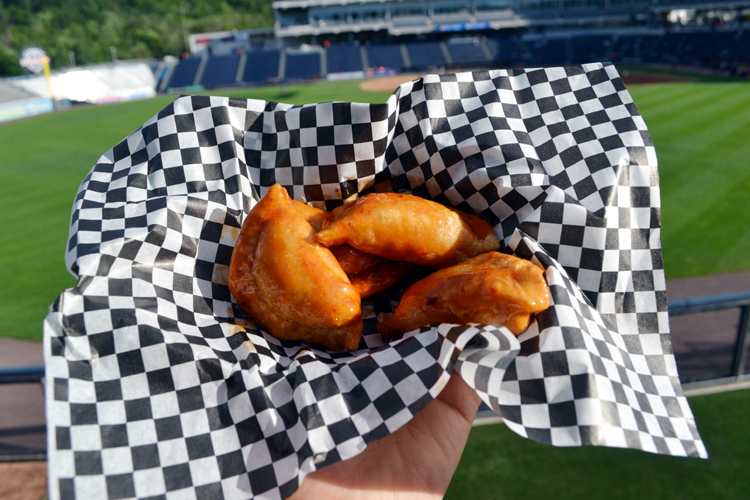 The NBT Bank Stadium curds were more gooey, which was a big plus, and the spiciness was a nice addition, too. From here, I could not only work on my blog while watching a wall-mounted TV across the room, but also keep an eye out the window to see what the weather was doing. 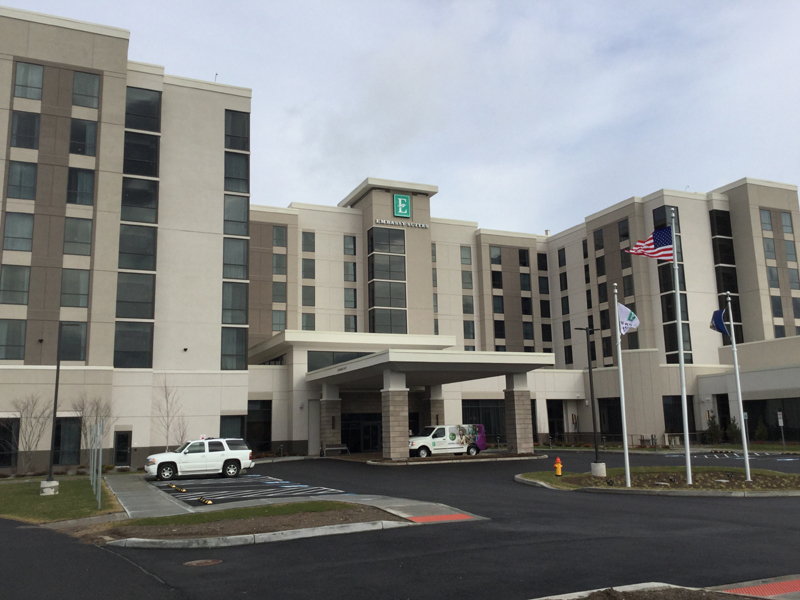 This hotel will definitely be my choice when I get back to Syracuse to see the Chiefs in action — and, hopefully, it won’t be that long before that happens. It’s impossible for me to understate how much I dislike talking about the weather, hearing about the weather and thinking about the weather. 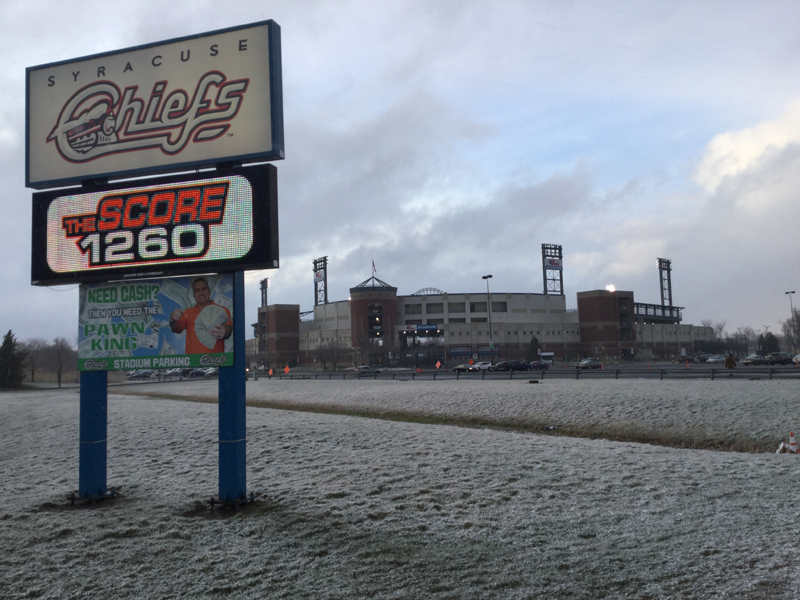 That said, weather did play a major factor in this week’s trip to Syracuse, so it’s going to come up a time or two in this blog post. Weather is, of course, the biggest obstacle to face during April baseball road trips. 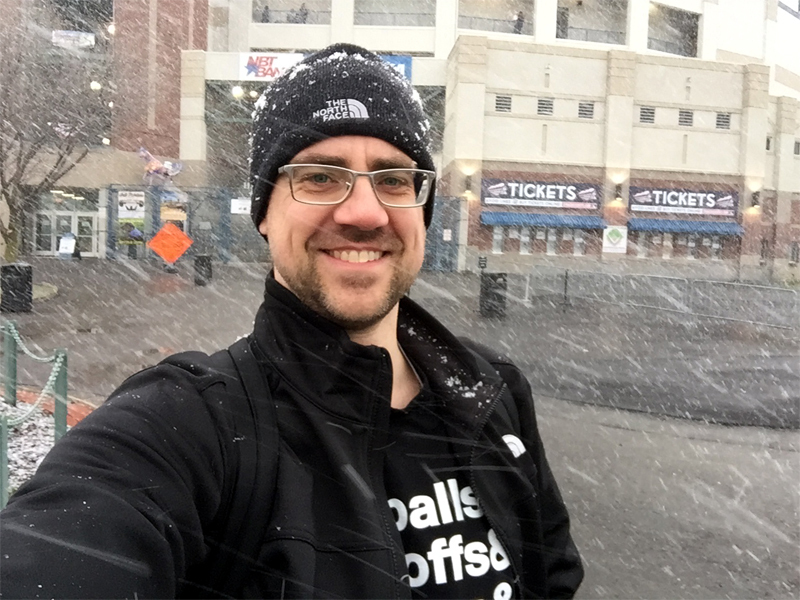 I’ve been rained out, snowed out and shivered for hours in ballparks during games in the first month of the season. 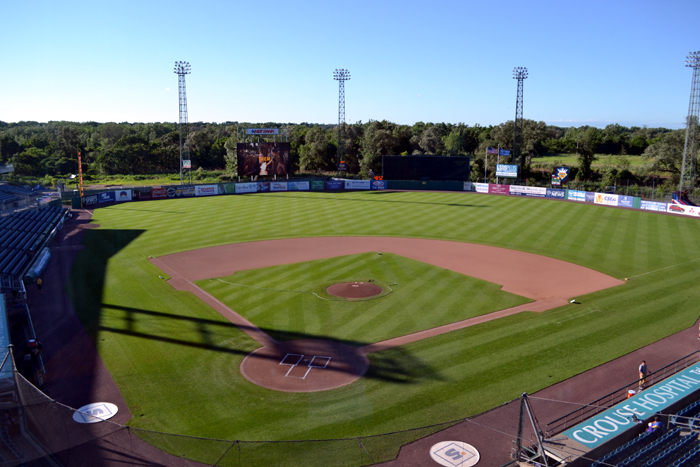 It’s probably smartest to wait until May to take a baseball trip, but when you’re eager to get your road tripping season underway, games in April are ever so tempting. 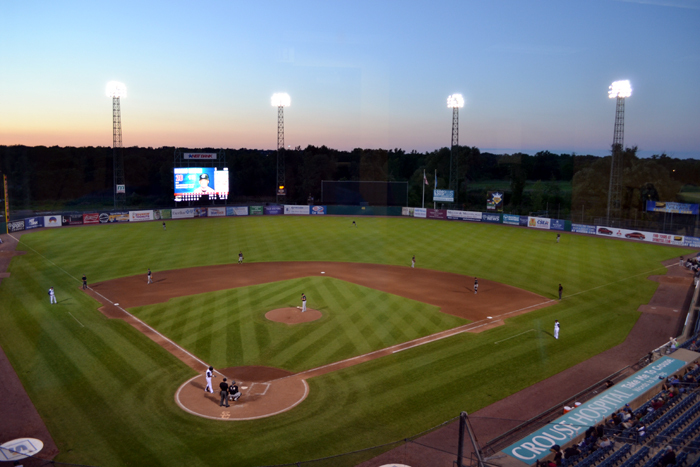 I scheduled three days in Syracuse a few weeks back because the Chiefs schedule was favorable — there were games Monday and Tuesday night, plus a bonus matinee game on Wednesday that I could attend before the three-hour drive home. 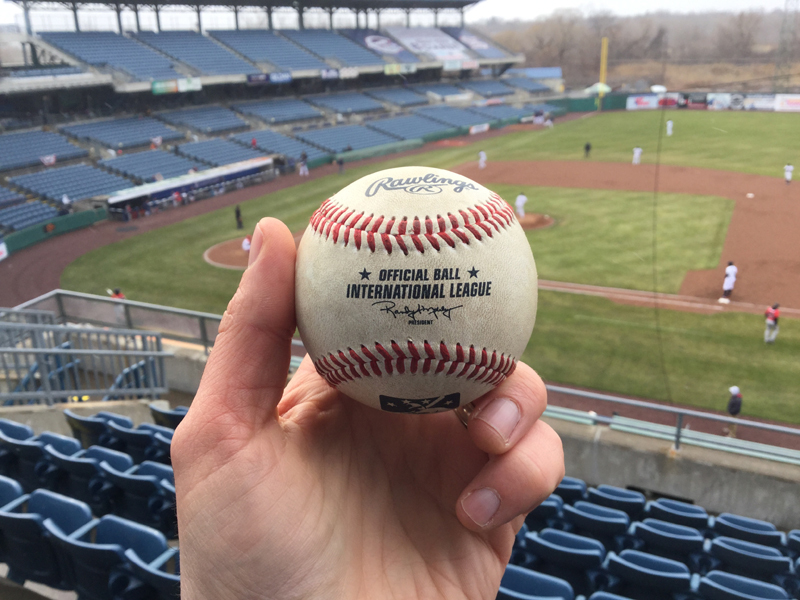 As the trip approached, though, and winter returned to not only where I live in Canada, but also to New York and several other states, I’d be lying if I told you I wasn’t concerned about seeing any baseball on this trip. We got hit with an ice storm on the weekend before I left, which meant that I had plenty of scraping to do before I could even see out my car windows enough to get on the road. The ice had turned to rain by the time I pulled out of my driveway at 9 a.m. on Monday, and I made it all the way to Syracuse without ever turning the windshield wipers off. I checked into my hotel about 2 p.m., and figured that there’d be no way the Chiefs would host the Indianapolis Indians at 6:35 p.m., so I vigilantly checked Twitter for updates on the game’s status. Big kudos to the Chiefs for canceling the game in a timely manner. Even though I love going to any ballpark, the idea of standing around in the rain for an hour or two, only to then hear that the game has been postponed, isn’t that appealing — and this is especially true when it’s 35 degrees! 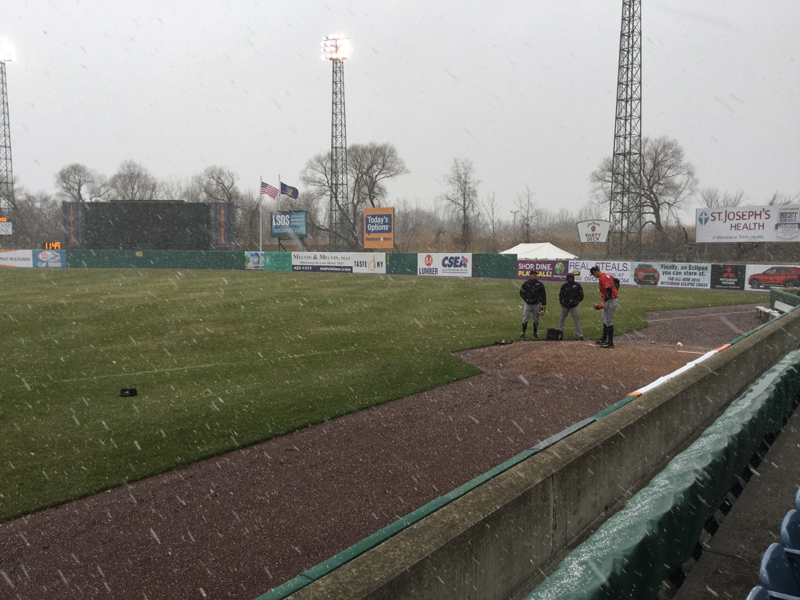 The postponement meant that the Chiefs and Indians would square off the following afternoon, April 17, and even though snow was in the forecast for that day, I was hopeful I’d get to see at least some baseball. Did you notice the emptiness of the stands? So did I — in fact, I’d never been to a game that was this sparsely attended. 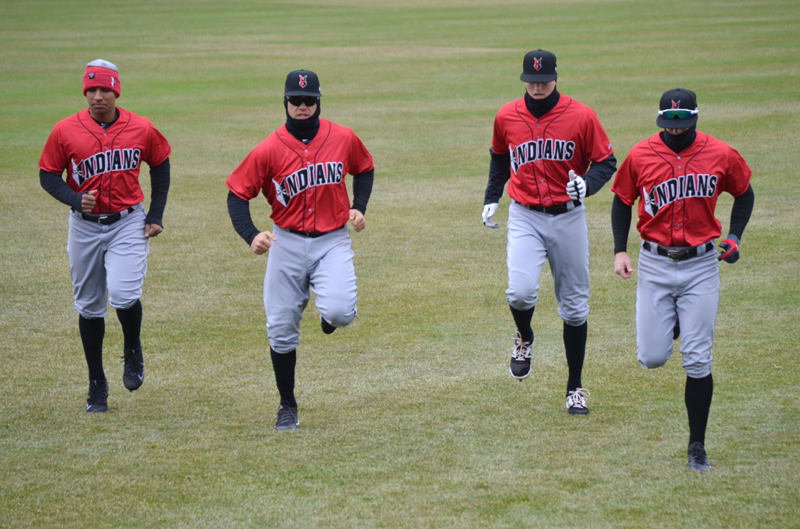 Then again, this was the coldest game I’d ever been to, and the only one with snow. I hardly blame Syracuse residents for staying at home on this afternoon. I should note, in fairness, that most of the fans who were at the game were up on the concourse to get shelter from the flurries. That said, I estimate fewer than 100 people were at the game. 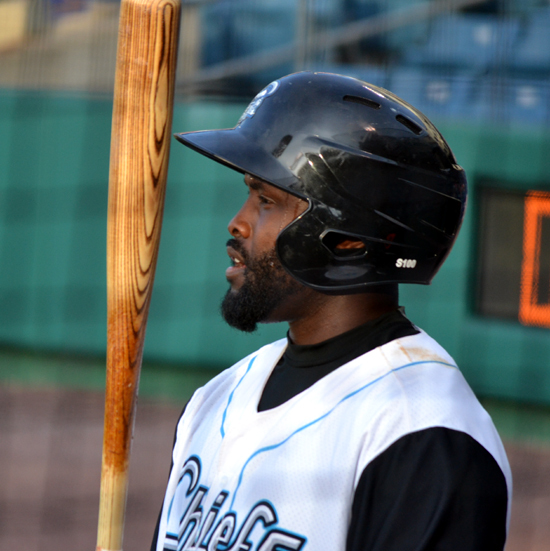 Playing right field for the Chiefs was Alejandro De Aza, who’s suited up for more than 800 MLB games in his career. 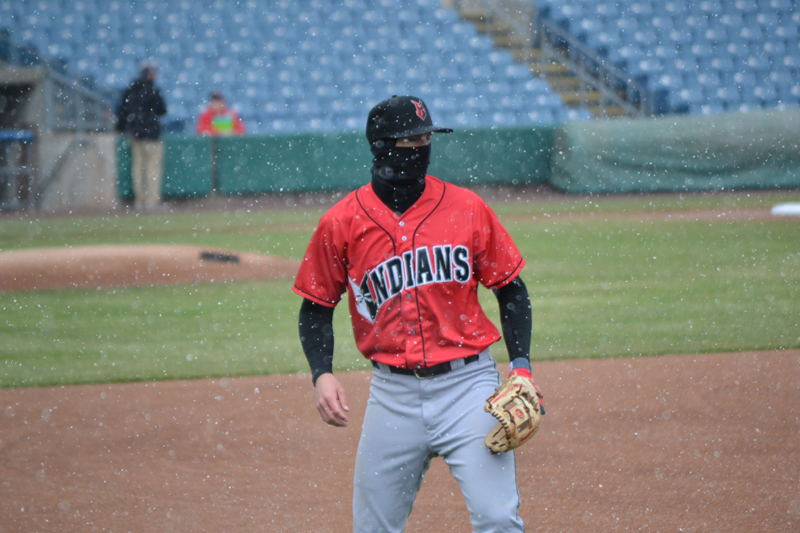 It was clear throughout the contest that he was having a hard time with the snow while he tracked down fly balls. 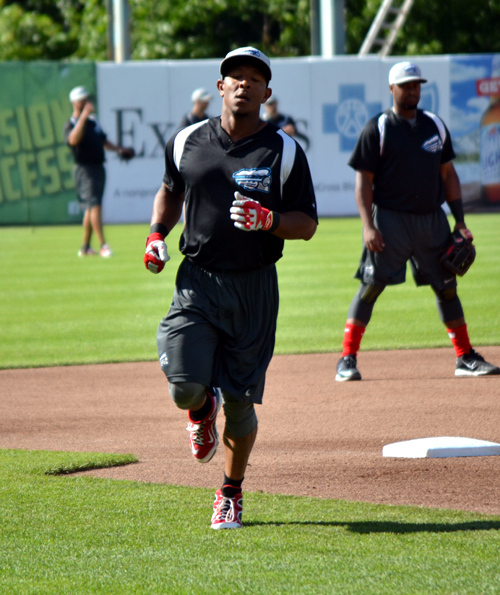 A couple times after making catches, I saw him shaking his head, wiping at his eyes and muttering something in Spanish. 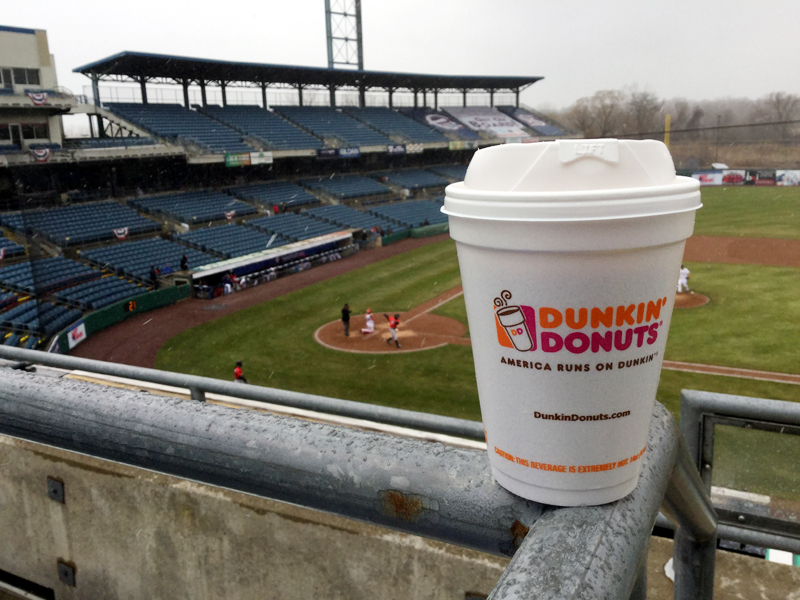 You might notice the lack of flurries in the photo above. 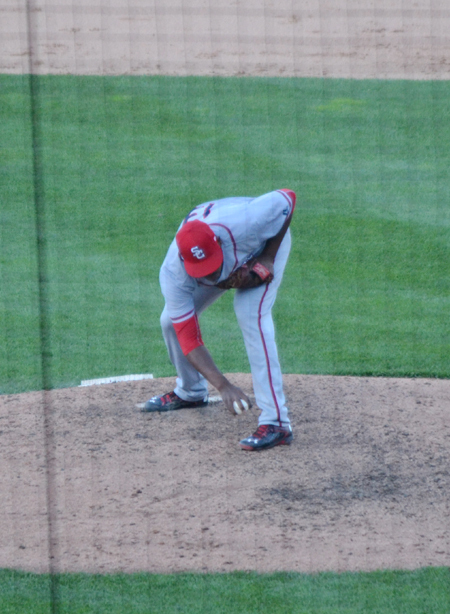 That’s how the game’s early innings went. There’d be thick flurries, followed by clear conditions — the one constant was the bitter cold. 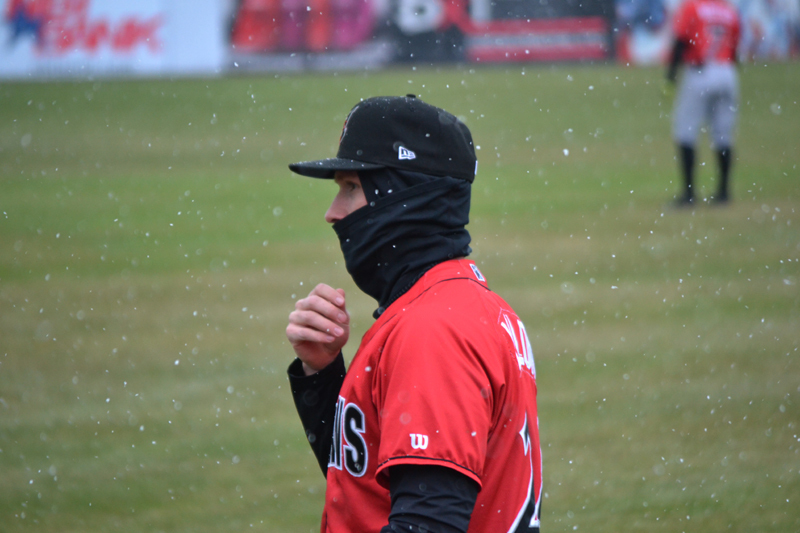 The flurries intensified to the point that there was a 20-minute delay in the game after three innings. The grounds crew covered up home plate and the mound, but didn’t use the big tarp to cover the entire infield — a positive sign, to be sure, that the delay would be short. I spent the delay trying to thaw out in the Hank Sauer Room, a private party room in the right field corner that I’d never previously entered. The Chiefs were gracious enough to open the room for fans looking for some relief from the cold, and there were a handful of fans hanging out in there for some warmth. 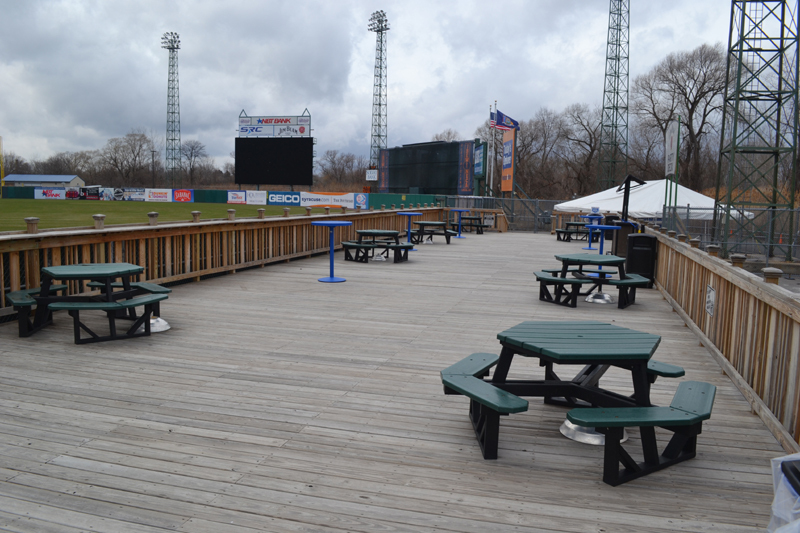 After the delay, I went back out to the concourse and any warmth that I’d enjoyed in the party room was quickly gone. The temperature was still in the 30s, but the fact that I’d been outside for several hours had finally caught up to me. Although I was wearing warm gloves whenever I could, my hands were bare when I was updating Twitter and taking photos. In fact, my hands got cold enough that typing quickly and accurately were a challenge. 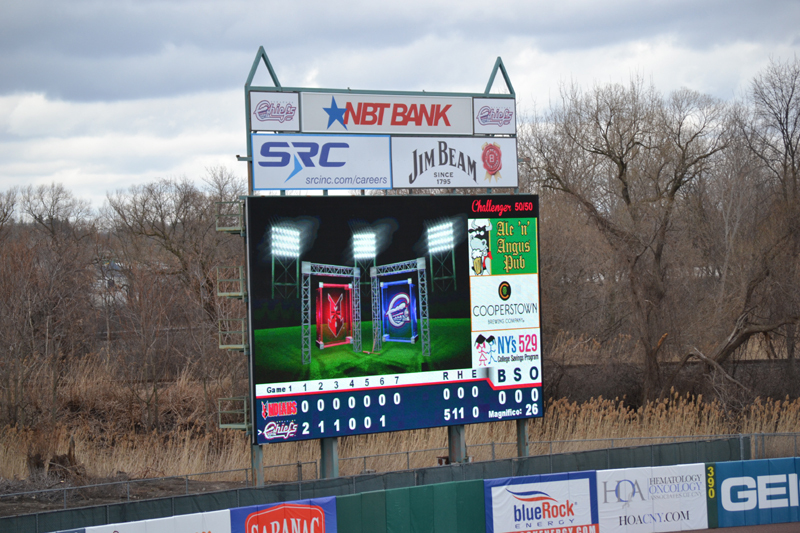 When the first game of the doubleheader wrapped up, I was anticipating waiting 30 or so minutes for the second game to begin — and I planned to stay in the warm spot that I currently occupied for the entirety of the break. 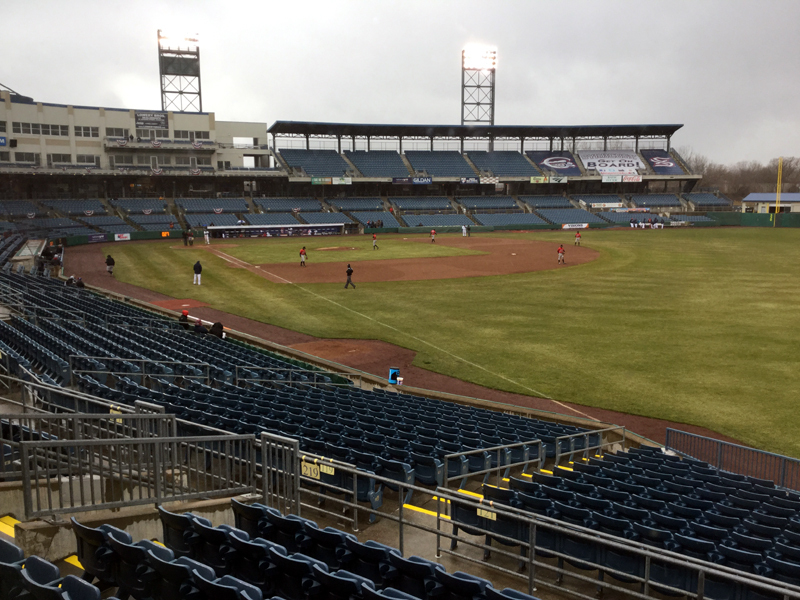 Just a few minutes later, however, a staff member arrived to tell me that management had opted to postpone the second game, as the weather was getting colder and the flurries were once again picking up. 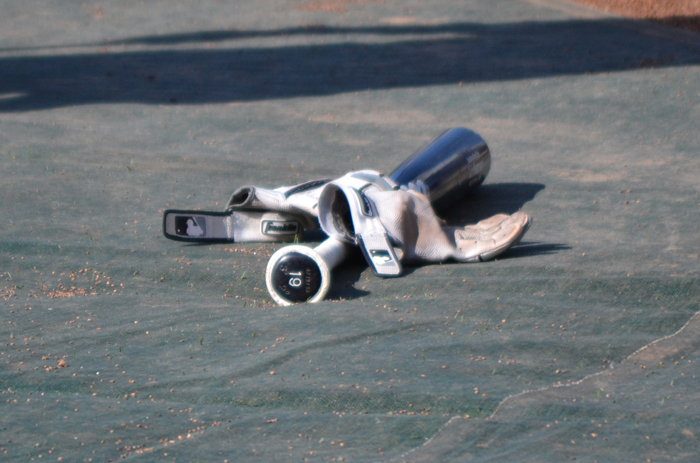 There was already a 10:30 a.m. game scheduled for the following day, so the postponed game would be tacked onto the end of that game to make another doubleheader. That suited me just fine, but instead of heading straight for the gates, I had one mission to fulfill. It’s one of the city’s newest hotels and gets its name from being across the street from Destiny USA, the sixth-largest mall in the U.S. A day earlier, when the Chiefs game was rained out, I walked around this expansive mall for about and hour and grabbed some dinner that I took back to the hotel. I did the same on this night, after thawing out for a bit, and ended up visiting the mall four or five separate times during my stay. 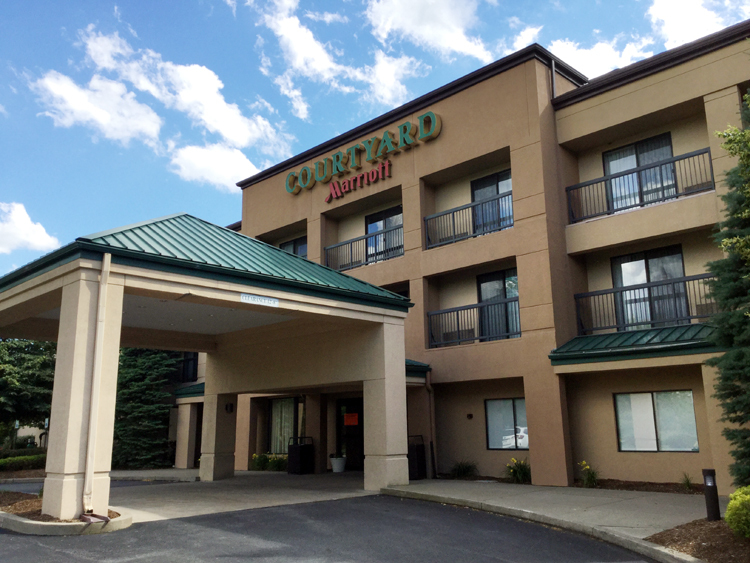 If you’re headed to Syracuse for a Chiefs game, I can’t recommend this hotel enough. 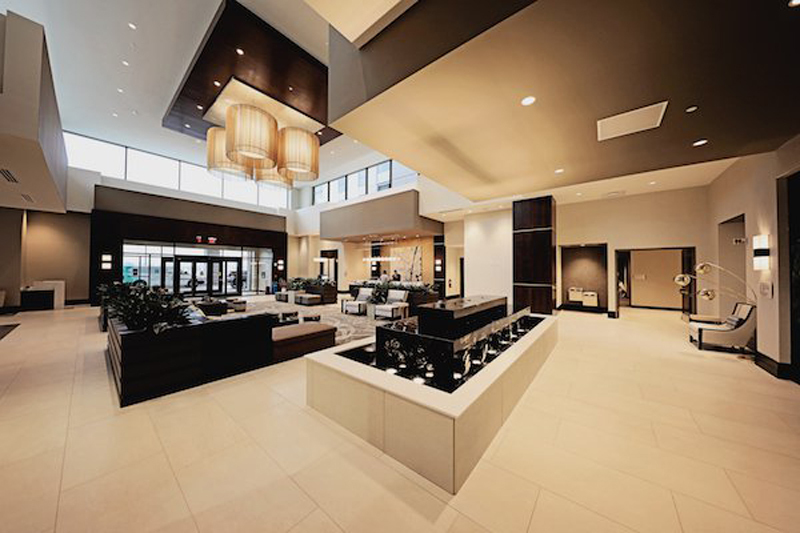 If you’re a big shopper, there’s no better hotel in the city. Or, perhaps you’re a baseball fan and your spouse isn’t — you can head to the game and she could head to the mall. I always get a thrill out of staying at the same hotel as ballplayers, even if I don’t have any interactions with them, and I’m forever scouting out people and trying to assess whether they’re players or not. 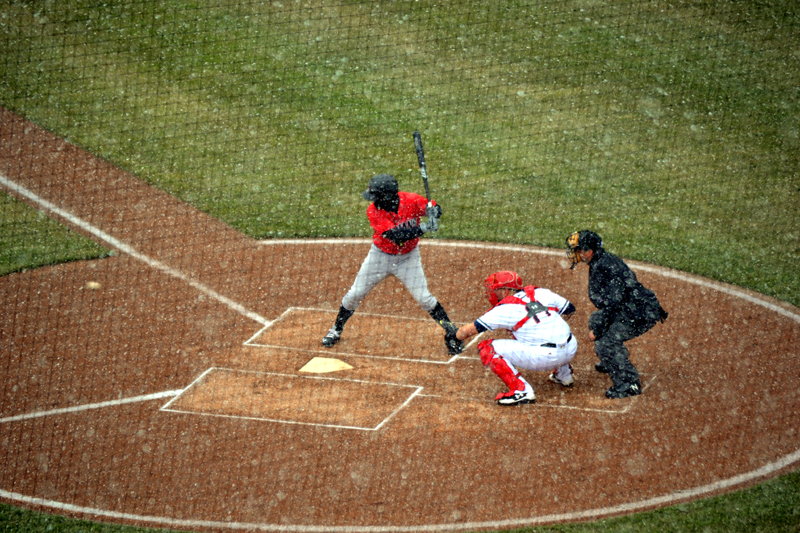 My snowy day at the ballpark was certainly memorable, even if I was uncomfortably cold for most of it. The cold didn’t deter me from heading back bright and early the following morning for a doubleheader, albeit one without fluffy white flakes. I woke up early on the morning of June 21 thankful that I wasn’t rushing to hop into my car to head to another city for another ballgame. 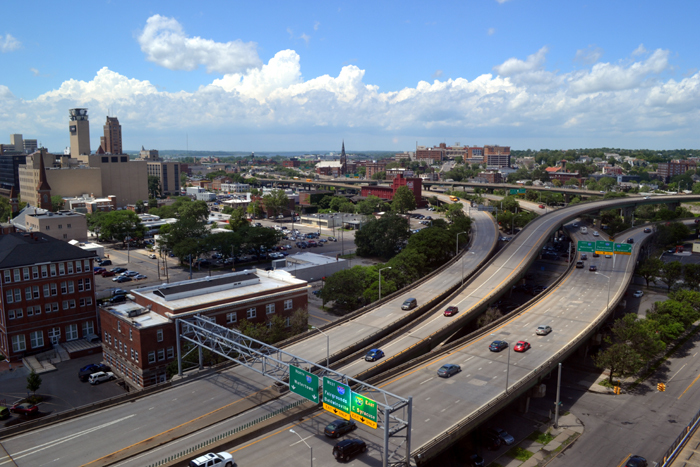 Even though hitting the road is always an awesome adventure, there’s a good feeling that comes with being in the same city for games on back-to-back days, and that was the plan for this short road trip. 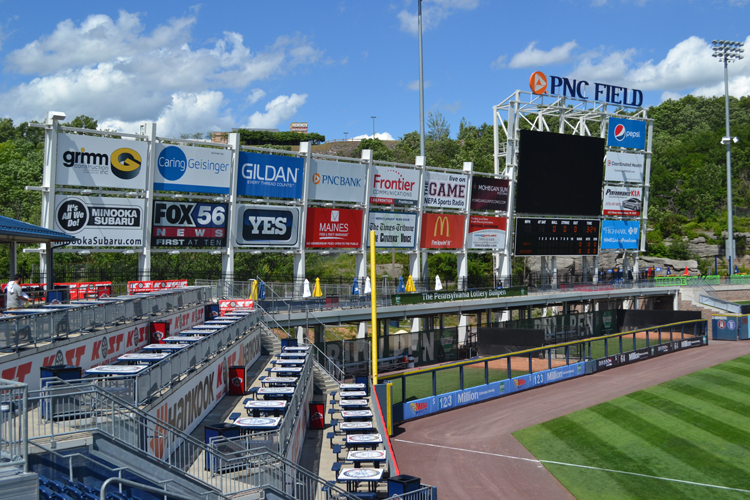 On my second day, I’d be hanging out in and around my hotel and anxiously awaiting that evening’s Scranton/Wilkes-Barre RailRiders game at PNC Field. 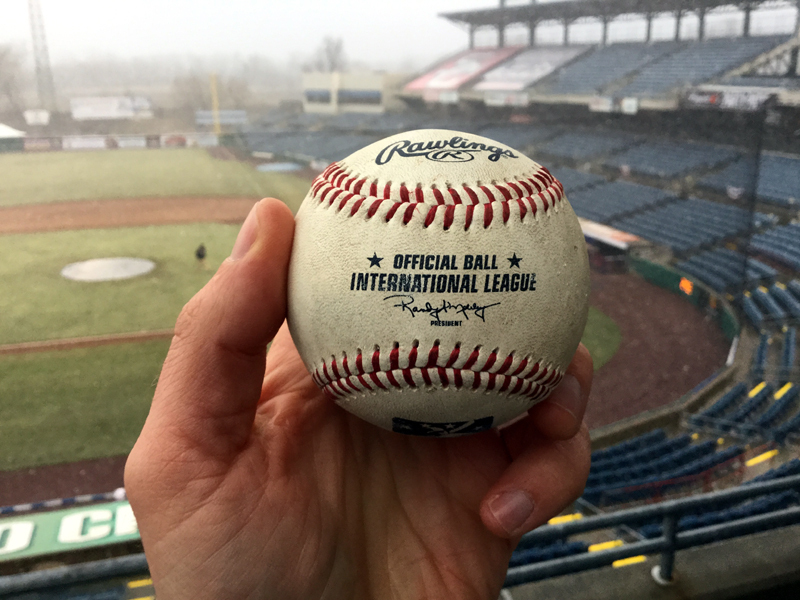 As you might have read about in my previous post, I’d attended a doubleheader at the International League ballpark a day earlier. I’d driven about six hours that day and went to the ballpark right after arriving in town, so I the schedule for June 21 was a little less busy. 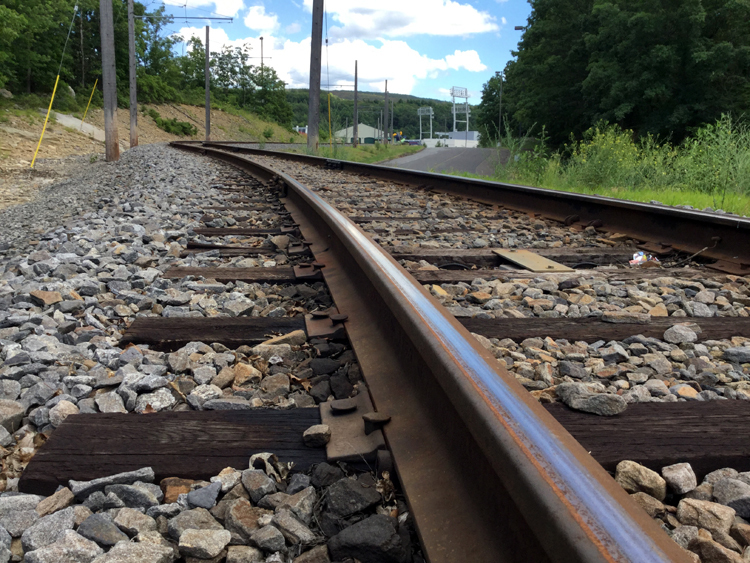 These rails run right up to the edge of the parking lot, and they’re not merely a decoration to support the RailRiders theme. 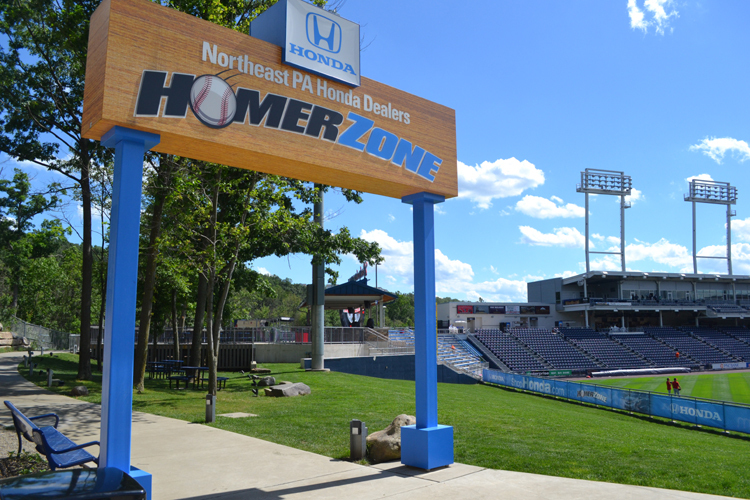 On select game days, fans can ride a trolley from downtown Scranton right up to PNC Field, which has to be one of the coolest ways to get to a baseball game. What I wasn’t content about, however, was that sinister-looking cloud over the right side of the ballpark. 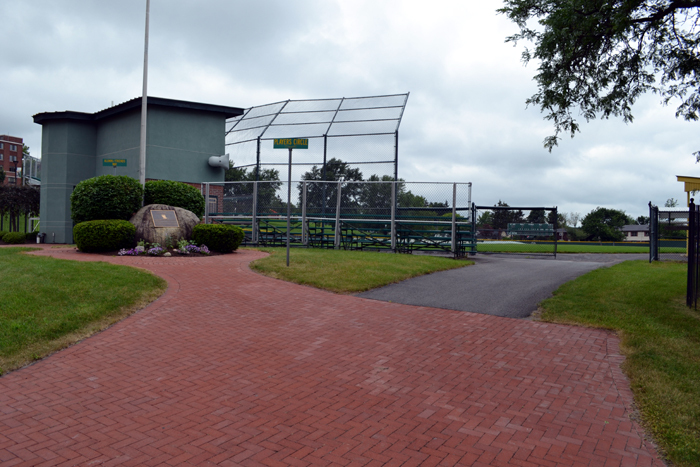 It wasn’t something that I’d really noticed during my walk, but when I snapped the above panorama and looked at it on my camera, I was a little unnerved that it might linger and threaten batting practice. 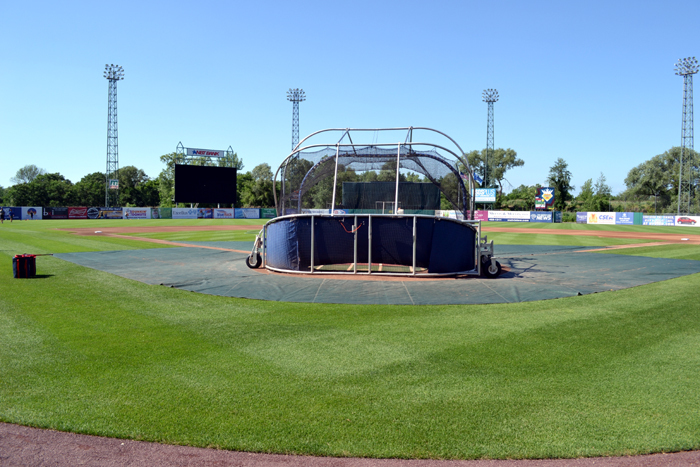 Fortunately, the dark cloud soon carried any threat of bad weather away with it, and the afternoon and evening were once again perfect for baseball. 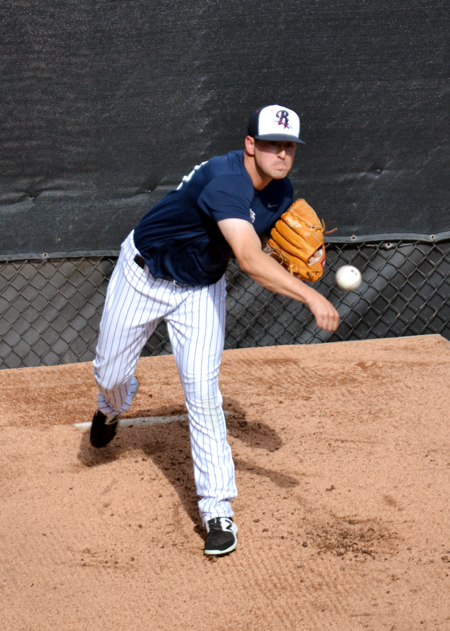 He’d started and won the game against Syracuse two days earlier, so he was simply getting some throwing in, rather than getting prepared to pitch that evening. 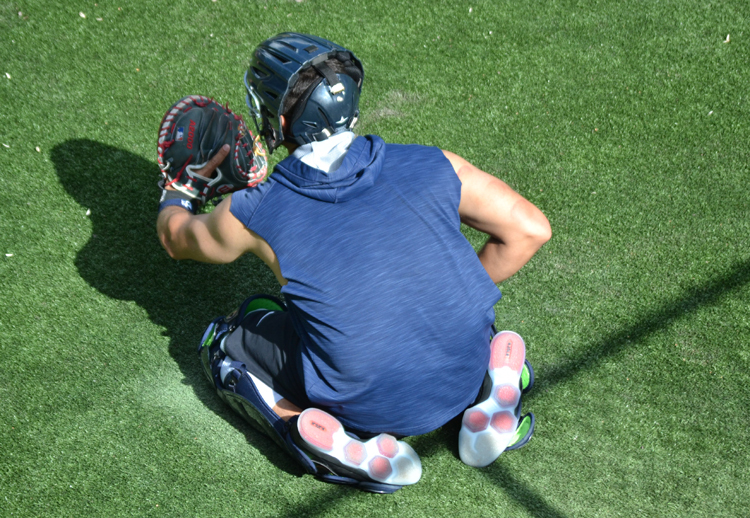 As I watched the bullpen session, I noticed two unique things about the catcher working with Lail. Can you spot them in the photo below? 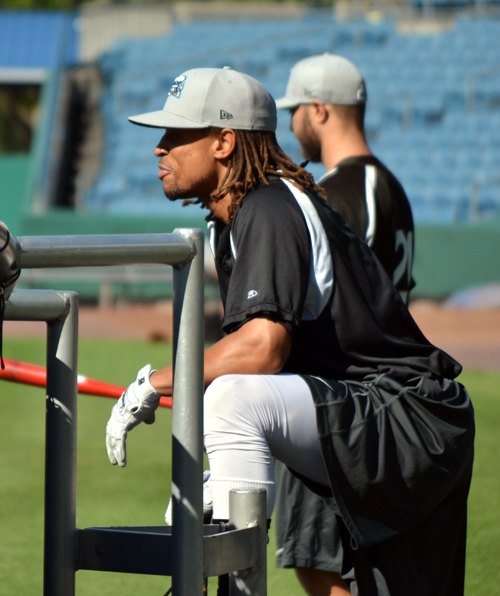 This was pretty much how I spent batting practice from the time I arrived until the time it wrapped up — a few minutes at the bullpens, a few minutes at field level, a lap of the ballpark, and repeat. It was absolutely glorious. 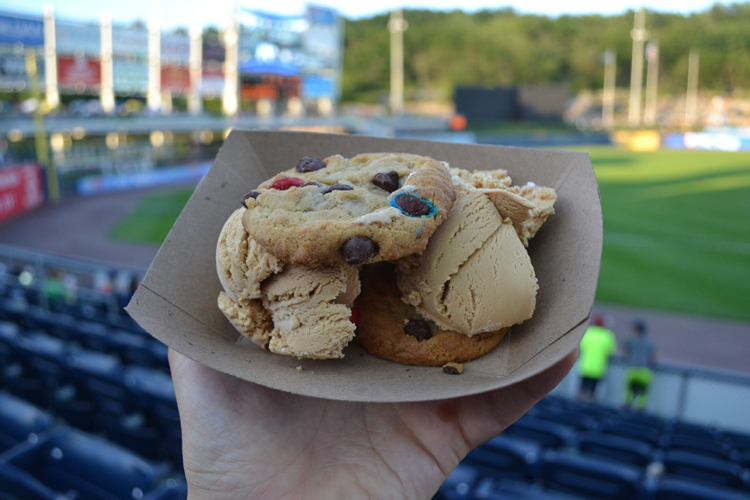 Once the gates opened, I made another lap of the concourse to consider some food options that I’d scouted out earlier. 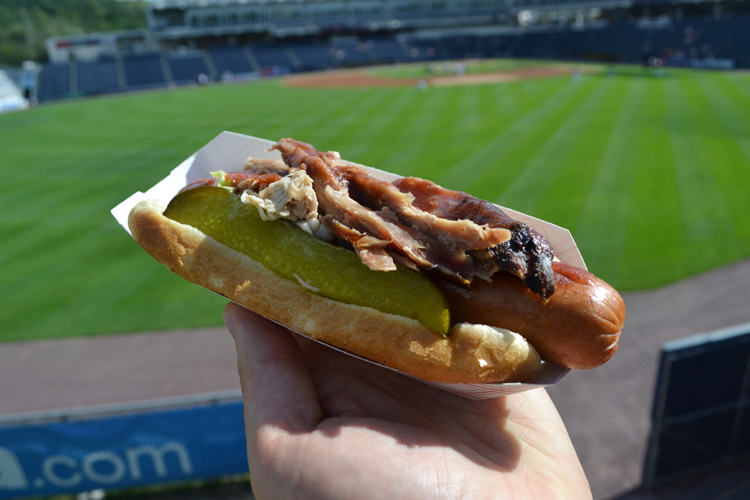 As I mentioned in my previous post, the PNC Field concession menu is impressive — and I found that mentally shortlisting a few items and then thinking about them as I walked made it easier to choose a worthwhile candidate. 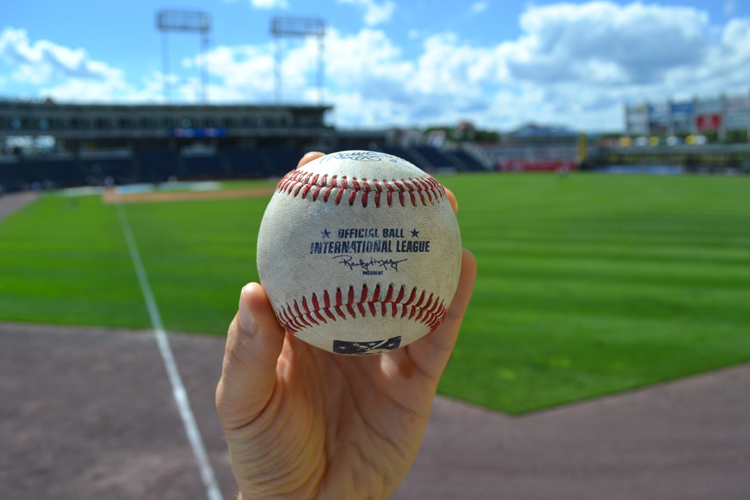 As I cut through the grass berm, my eyes caught sight of a BP ball that had obviously been overlooked by the ushers and even by the fans who were in the park at this point. Fortunately, the meal was good — the perogies were cooked perfectly, meaning that they weren’t too soggy and they weren’t too crispy. The sauce was nice, too, providing a decent amount of sweetness and heat without blowing my head off. 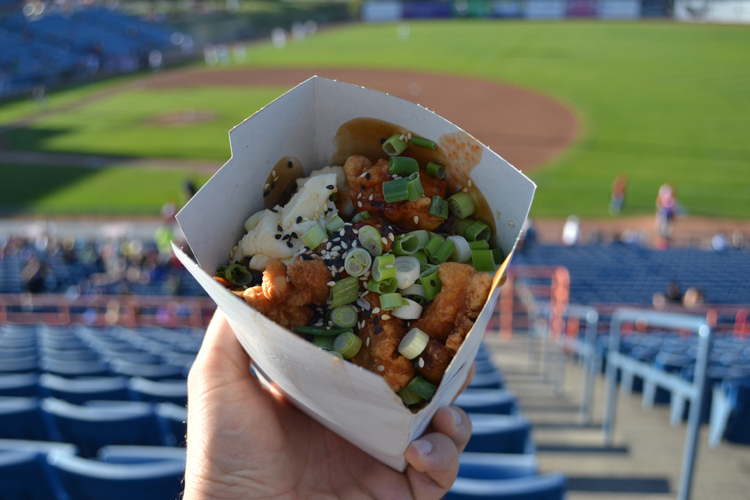 What really would’ve knocked this dish out of the park, though, would’ve been some fried chicken pieces, green onions and sesame seeds, like they independent Ottawa Champions do with their Tao Poutine. 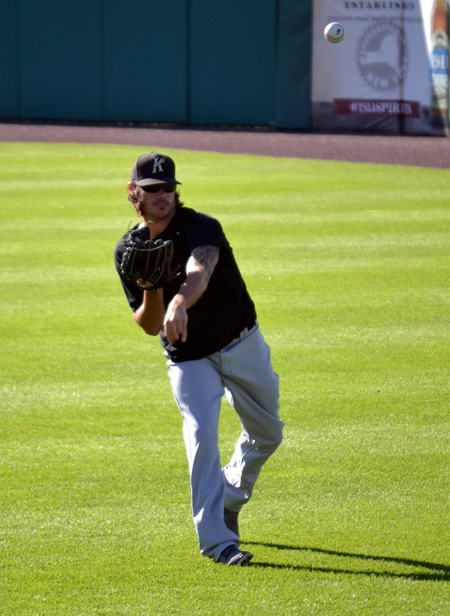 I figured this might be an anomaly, but as I continued to take photos of the right-hander’s tosses, I noticed it each time. Just as he released the ball, he really opened his eyes. Slightly amused, I continued snapping shots — and noticed this facial expression each time. I took enough shots that I could make a coffee table book called “Eyes of Acevedo,” but I’ll hold off on that million dollar idea for now. 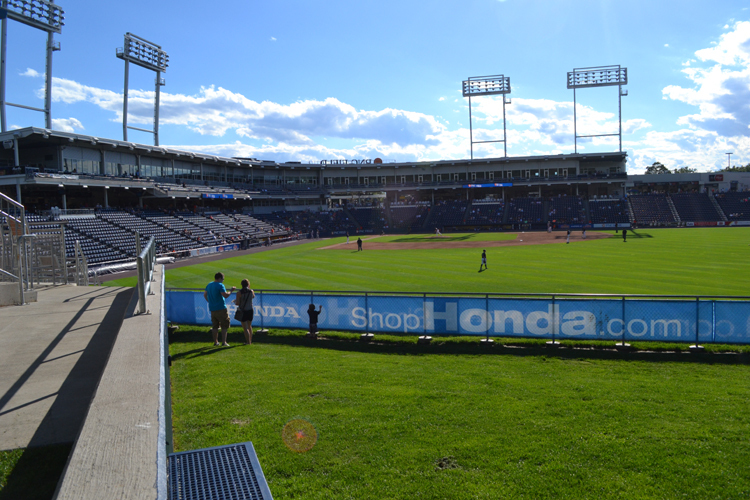 I’d have liked to sit for a while on the other side of PNC Field, but the sun sets directly over the third base side, making it extremely bright for those toward the right field foul pole. Don’t get me wrong — this is a great spot later in the game or during afternoon games, but the sun is just a little too bright for my liking for 7:05 p.m. games. Verdict? It was tasty enough, but I’m afraid it didn’t hold up to the cheesesteaks I’ve eaten at Citizens Bank Park in Philly, although the unique toppings were a fun twist. 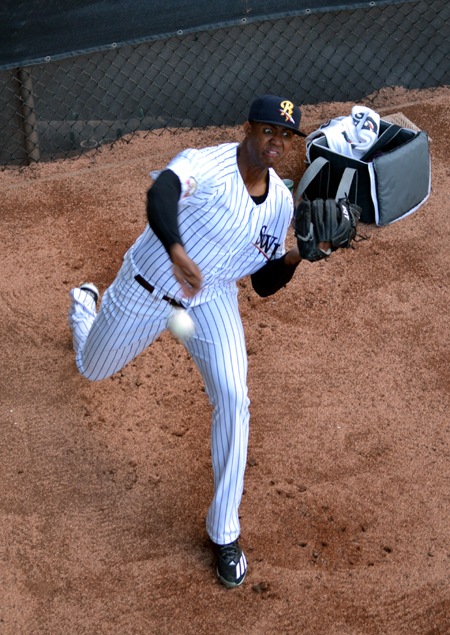 Less than 10 minutes after the game’s final out, I was back in my hotel room, where I repeated the agenda from the night before — a late-night swim, watching baseball highlights on TV, enjoying the balcony for a little bit and, finally, hitting the sack to close out a great two days with the Scranton/Wilkes-Barre RailRiders. 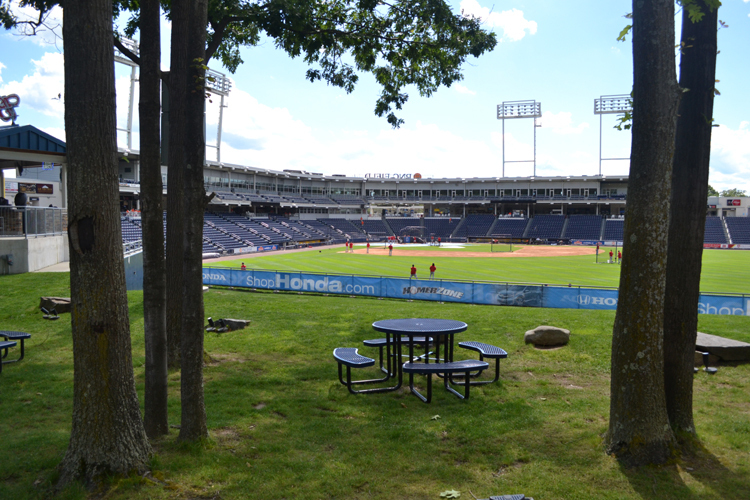 The last time I visited PNC Field, this happened. 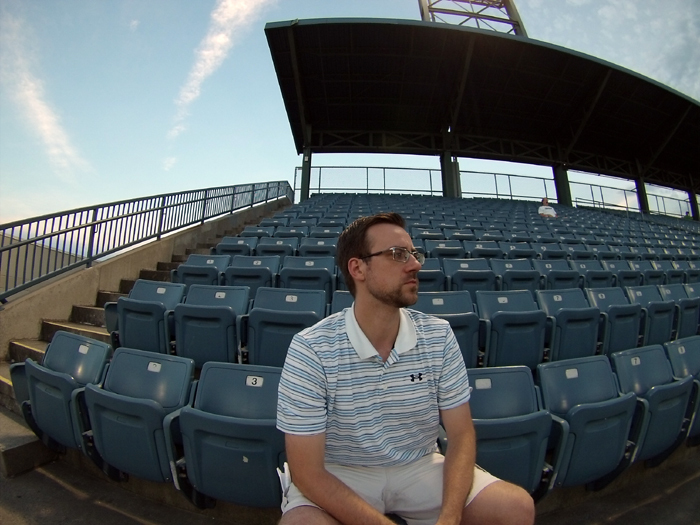 Yes, but as I made the six-hour drive to Scranton on the morning of June 20, I was partly relieved that there was no high-profile MLB rehab scheduled for my visit. Don’t get me wrong — seeing Derek Jeter from just a few feet away will undoubtedly go down as one of the coolest memories of all my ballpark adventures, but that day was a little crazy. 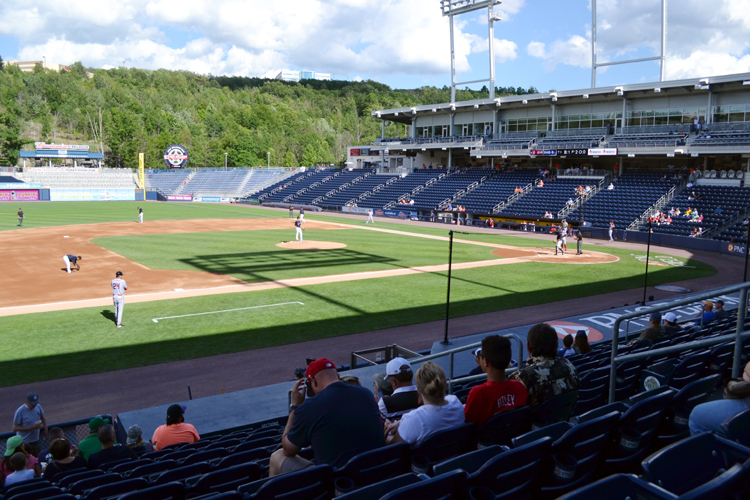 From the focus on Jeter to the enormous crowds, I didn’t have as much of a chance as I’d have liked to explore the then-recently renovated PNC Field. 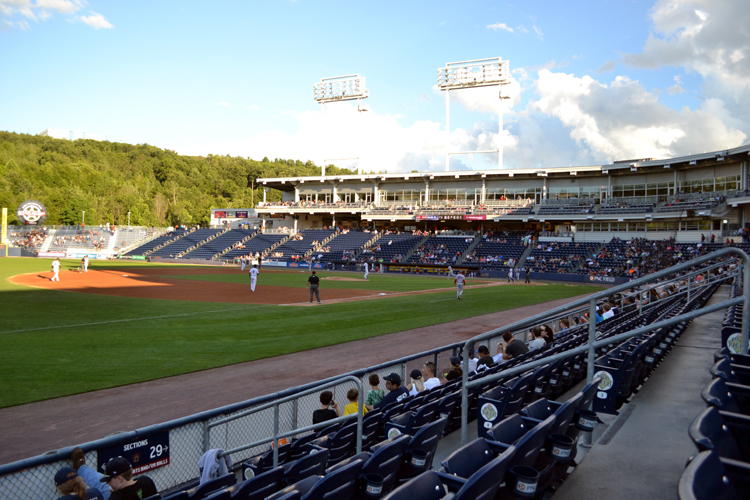 My latest visit to the International League ballpark, located just outside of Scranton/Wilkes-Barre in Moosic, PA, would be my third visit since 2011. 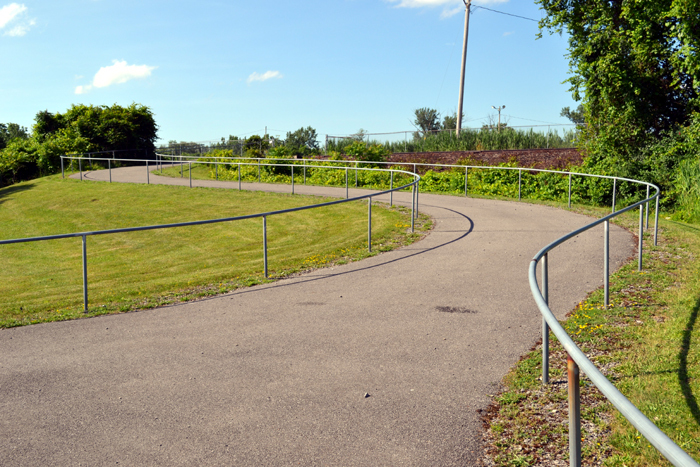 The first time I was there, I saw a 1980s-era park in a major need of a facelift. 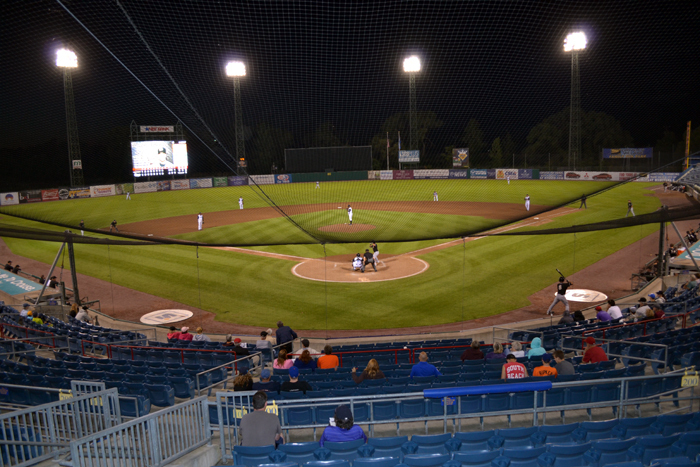 That came in the form of a $40+ million renovation that was extensive enough to cause the team to play on the road for the entirety of the 2012 campaign. 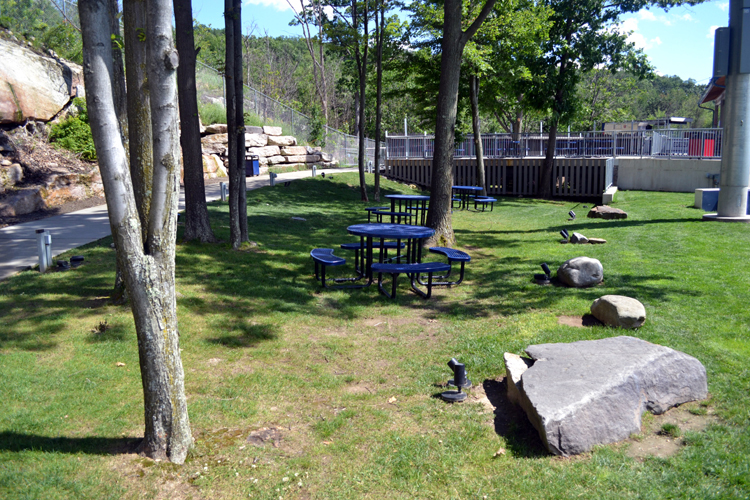 The park opened again in 2013, just a few months before I visited, and the transformation was outstanding. Now, I was anxious to return again to see how the changes had held up and what new elements there were. 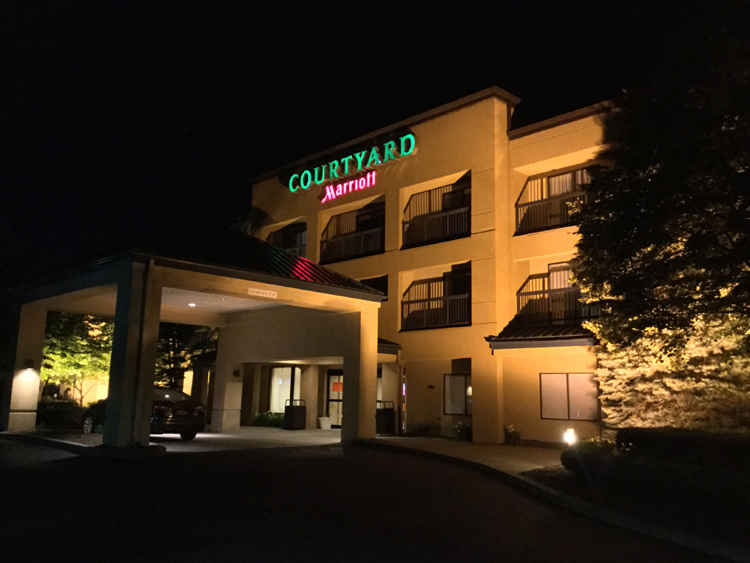 As I did in 2013, I was staying at the Courtyard Scranton Wilkes-Barre, which you’ll read more about later in this post. I’d selected it again not only because I had a great stay last time, but because it’s within walking distance of the ballpark. 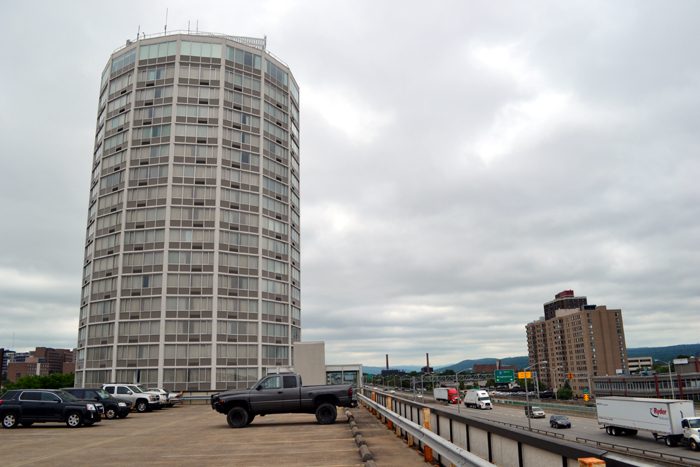 It’s also within walking distance to a ton of restaurants and stores, and that meant that after parking my car prior to check-in on June 20, I didn’t get behind the wheel again until checking out on the morning of June 22. 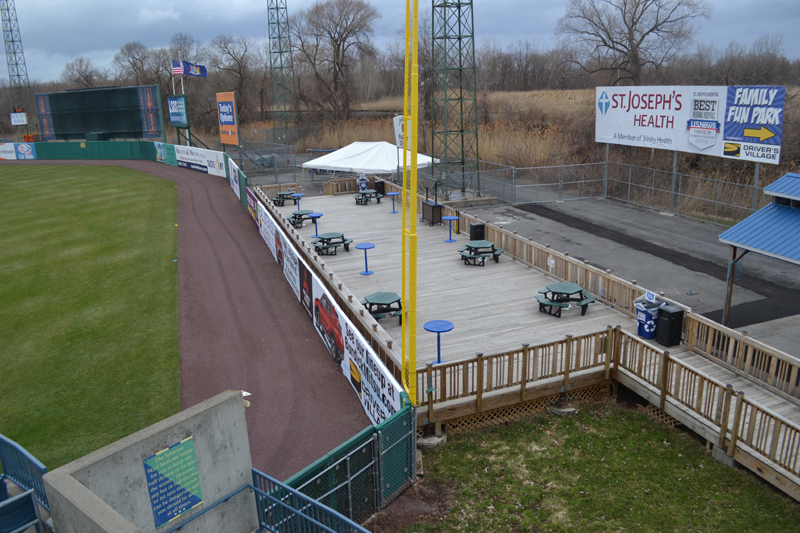 Although the 2012 renovation included a long list of changes, my favorite was how the concourse was built to wrap around the entire field, meaning that you can watch the game from beyond the outfield fence. This is one of my favorite features at any park. 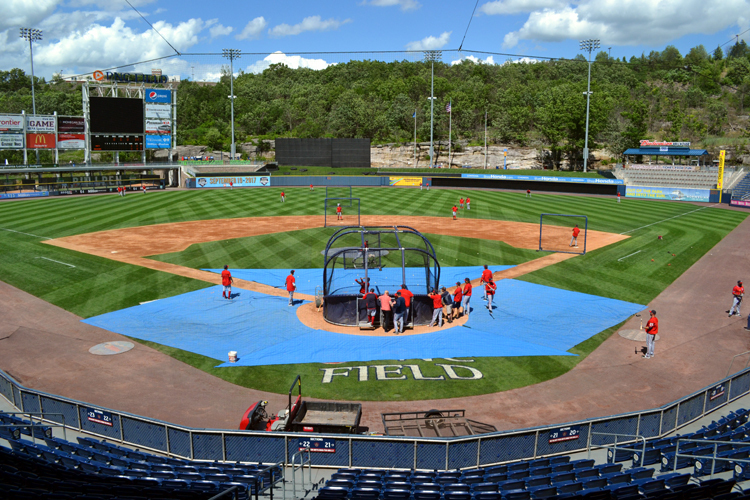 Above, you can see the elevated walkway above the bullpens in left-center, the grass berm throughout much of the outfield, and the party deck around the right field foul pole. Absolutely perfect. 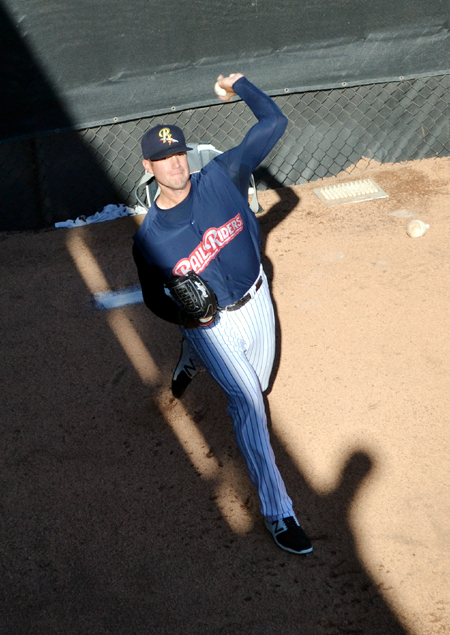 It’s always cool to be able to get close to the pitchers warming up in the bullpen, and the unique design of PNC Field means that you can virtually stand atop whoever is throwing — and that gives you a true appreciation for the nastiness of the pitchers at the Triple-A level. They weren’t interfering with fans’ views or players’ views; they just seemed, well, super noticeable. 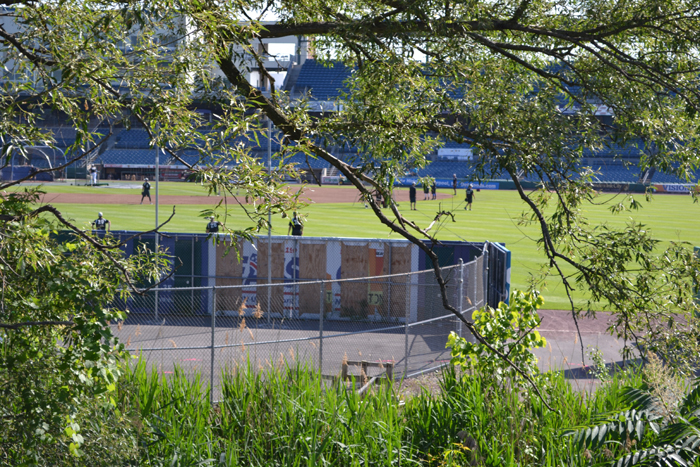 Another thing that was super noticeable and that irked me more than the slowly moving shadows were the nets over the dugouts. 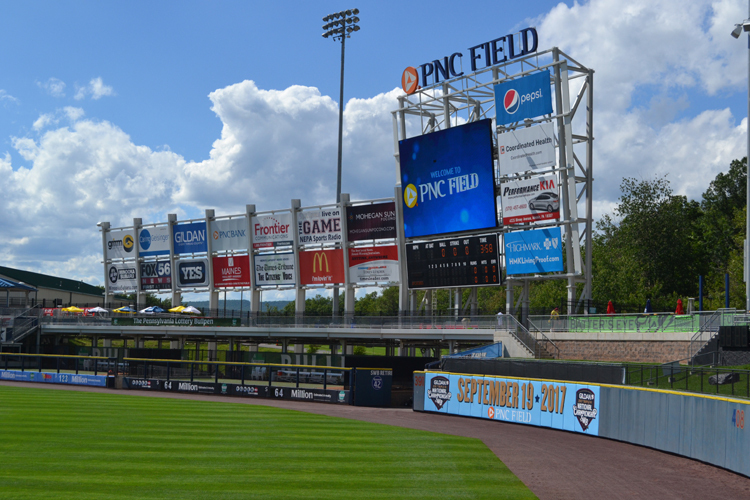 This feature wasn’t present when I last visited PNC Field, but it’s unfortunately starting to crop up around baseball. Look, I’m all for the idea of fan safety, and I hate the thought of someone getting seriously hurt at a ballpark of all places. 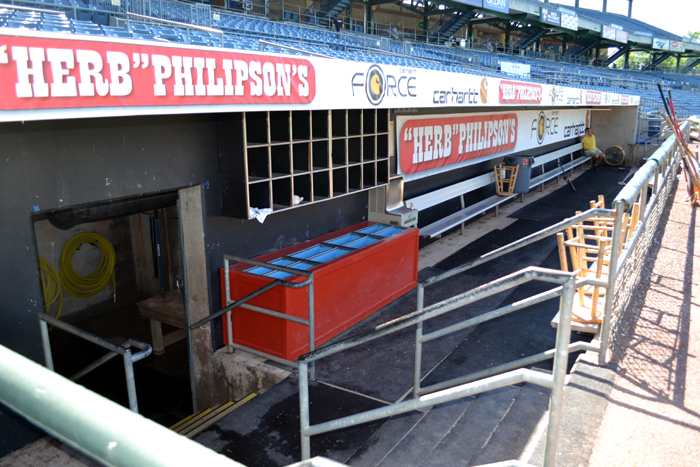 That said, the seemingly tiny amount of netting has a weird effect of making the action seem dramatically farther away when you’re behind the dugout. 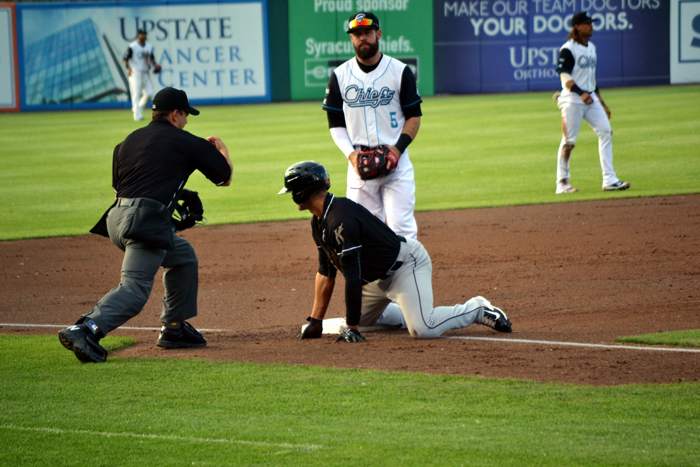 One of the great things about baseball is the close connection that you get with the players, which is something you don’t get in many other sports. 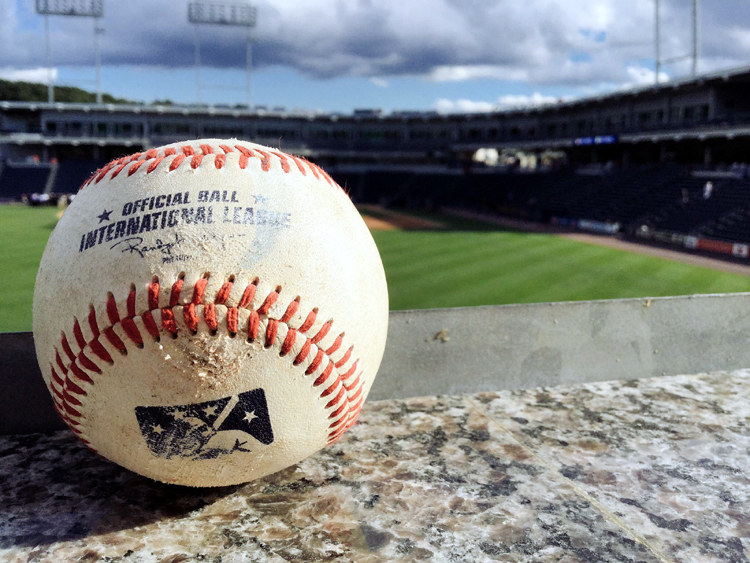 There’s no real barrier between you and what’s taking place on the field, so whether it’s a pitcher tipping his cap to your applause or an infielder tossing the third out ball into the seats, it almost feels as though you’re part of the game. 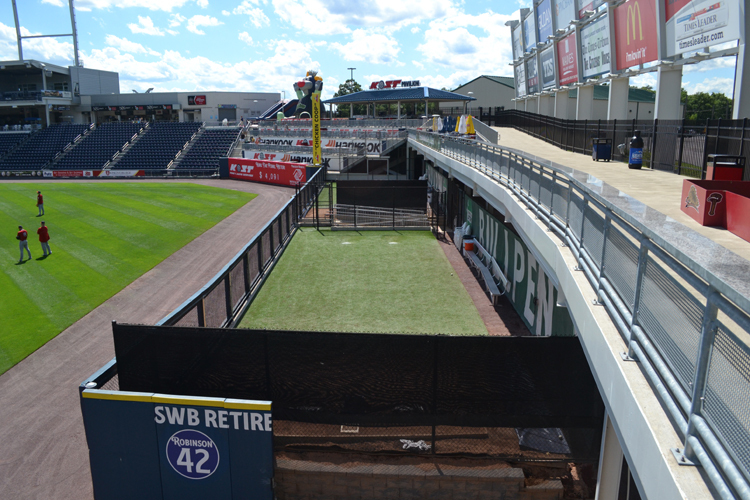 With the netting up, that’s no longer the case, and I find it sad. 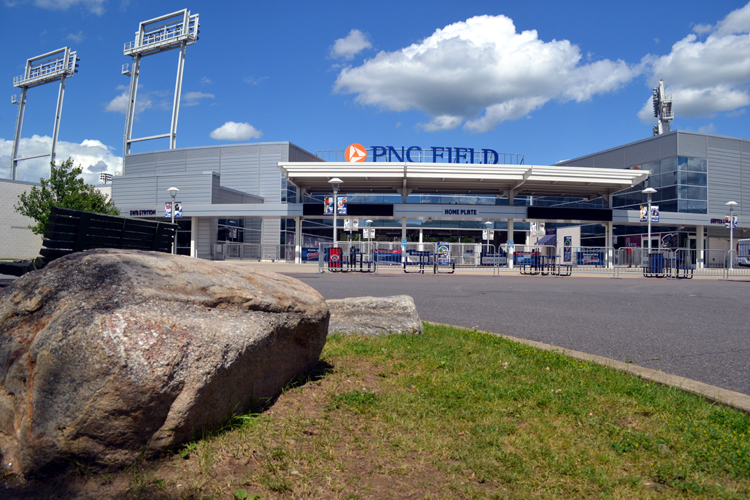 And that’s not a knock on PNC Field — it’s just a comment on dugout netting in general. I wanted to be far enough behind the wall that I could run forward on a short home run, rather than have to backpedal up the hill. I gave this spot two innings — during which time, nothing came remotely close. 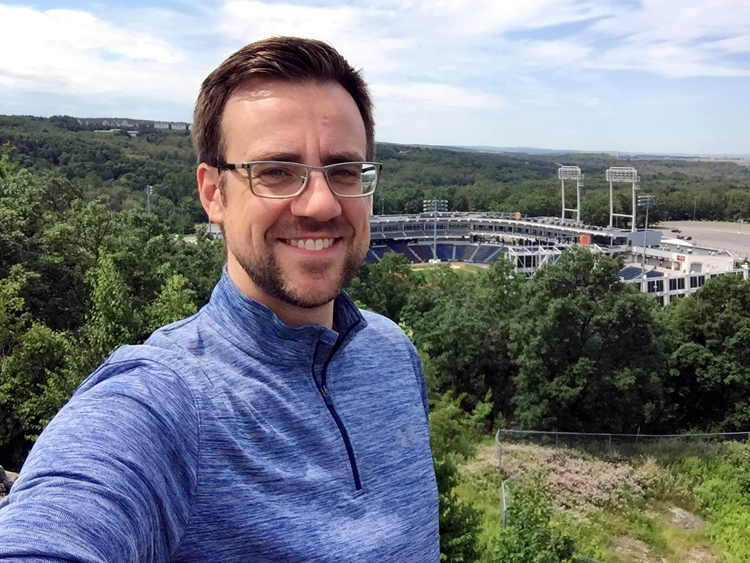 The decision I faced was to stay in the area longer or continue wandering around the stadium, and the latter prevailed as it always does. 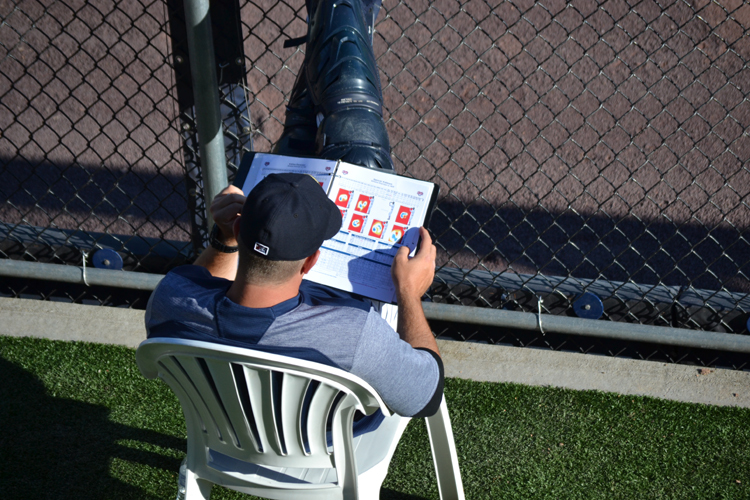 I was able to zoom in with my camera and was impressed with how advanced this stuff was — MLB-caliber scouting reports with all sorts of situational stats and a comprehensive two-page package on each player who stepped to the plate. I’m talking percentage of pitches swung at in the zone, first-pitch swings against right-handers versus left-handers, swings and misses based on different velocities of each pitch type and a whole lot more. Really interesting stuff. Normally, the last out of any game I attend is a bit of a melancholy affair, but not today. Instead of heading out of the stadium, I got to stick around for the second game of the twin bill. Of course, the flavors I selected probably weren’t the best pairing, but the dessert was a winner. I’d never eaten root beer ice cream in the past, but it had an awesome flavor that was virtually identical to its namesake soft drink. 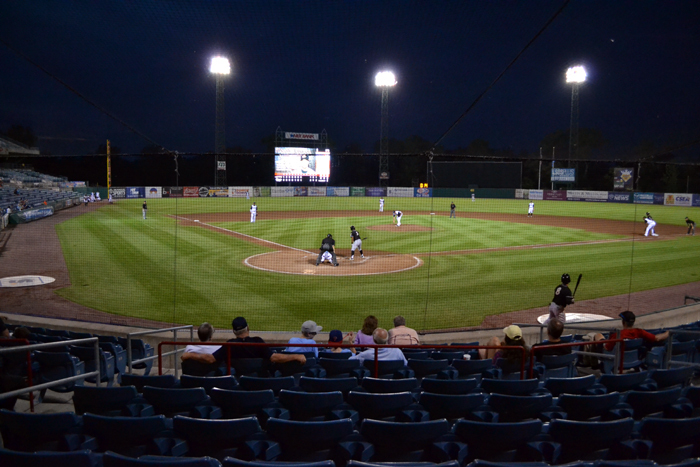 After another lap around the park, I returned to the above section in the sixth inning. 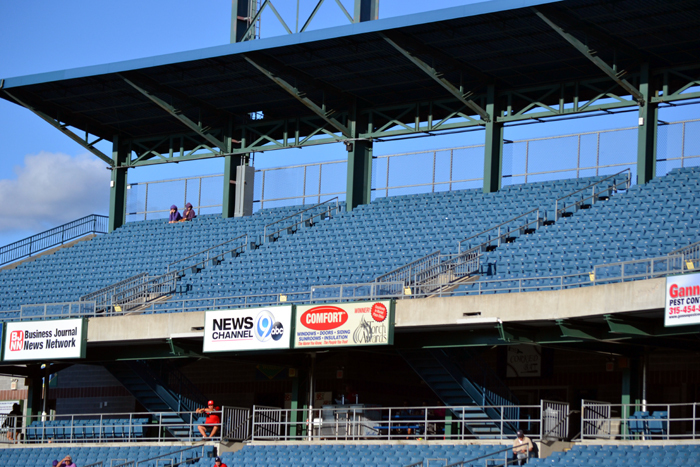 By now, the fans who’d been in this area in the above photo had gone, which meant that I was the only person sitting in the multilevel deck. 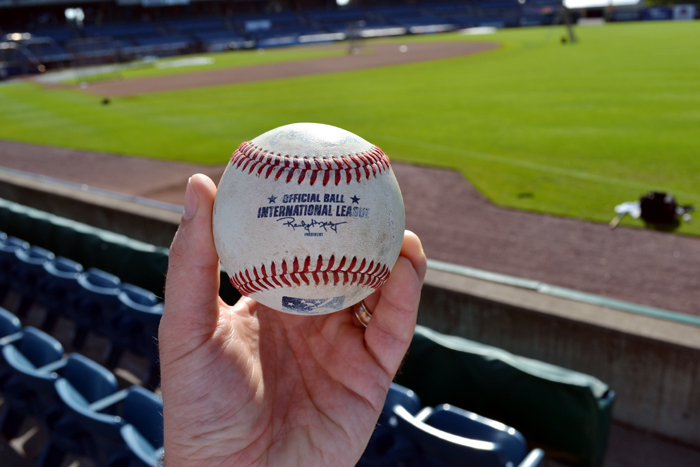 Ideal for a home run ball, right? Yes, but nothing came my way. 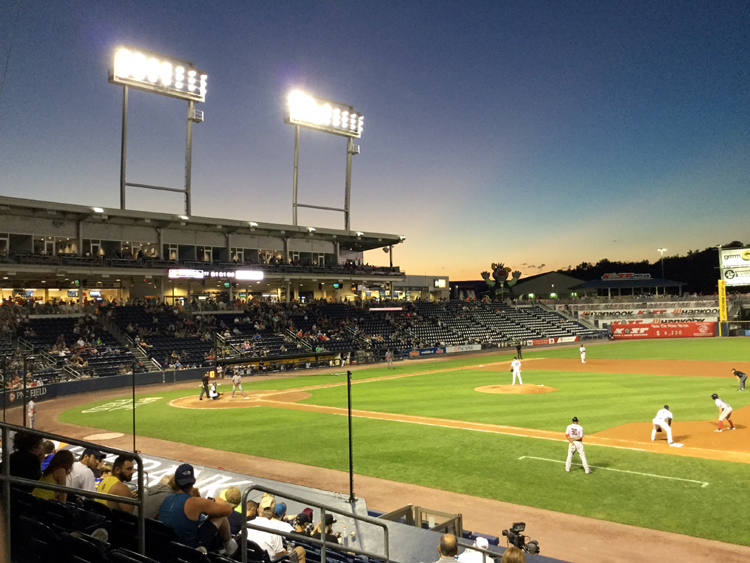 That did nothing to dampen a long and awesome day at PNC Field, which had totaled about seven hours. 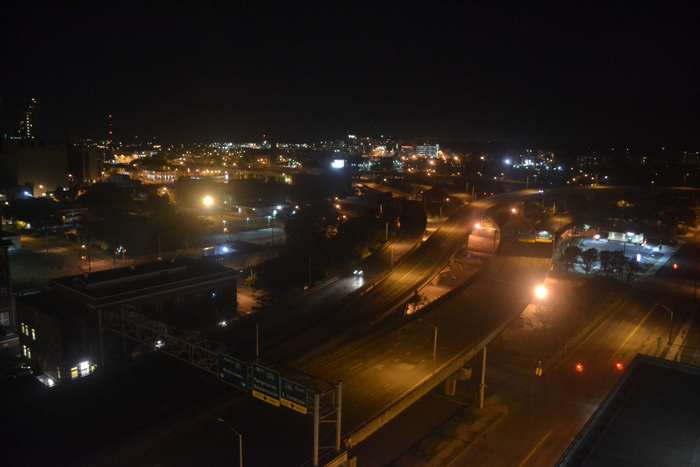 After my swim, I sat at my laptop for a while to catch up on some Twitter messages, and then hung out on the balcony for a little while to enjoy the night view — and then it was time for bed in anticipation of another big day in Scranton. Getting to spend consecutive days watching baseball in any given city is awesome. 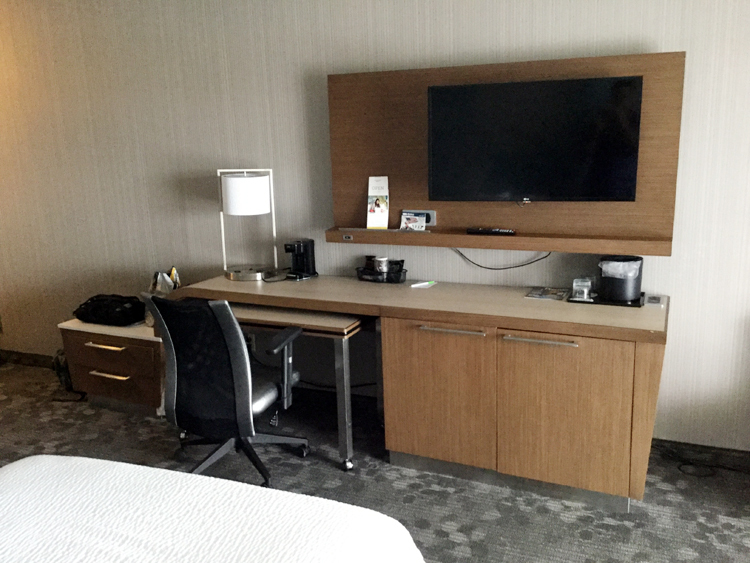 So, after an exciting first day in Syracuse on June 22, it was great to get up early and enjoy hanging out in my hotel for the day before heading over to NBT Bank Stadium. 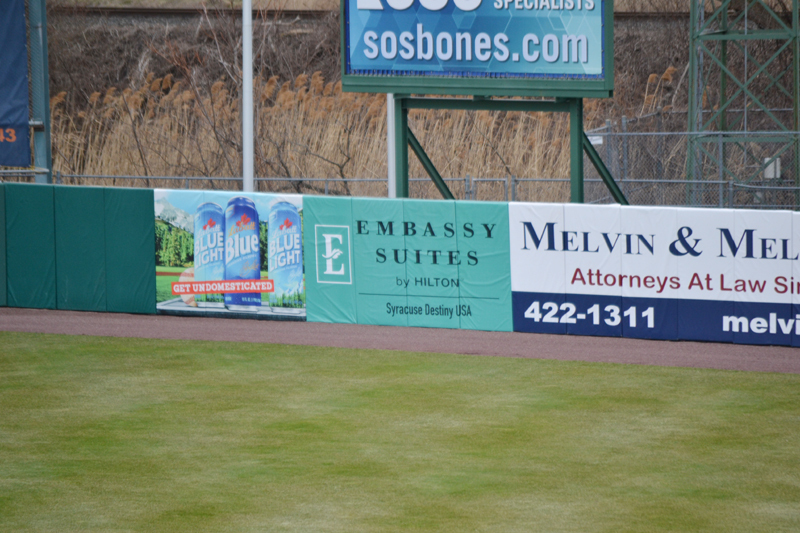 … and I was looking forward to another perfect day of baseball with temperatures in the upper 70s. The evening’s game was set to begin at 7 p.m. For 7 p.m. games, I usually get to the park between 4:30 and 5 p.m., but I had a couple good reasons to be earlier on this day. 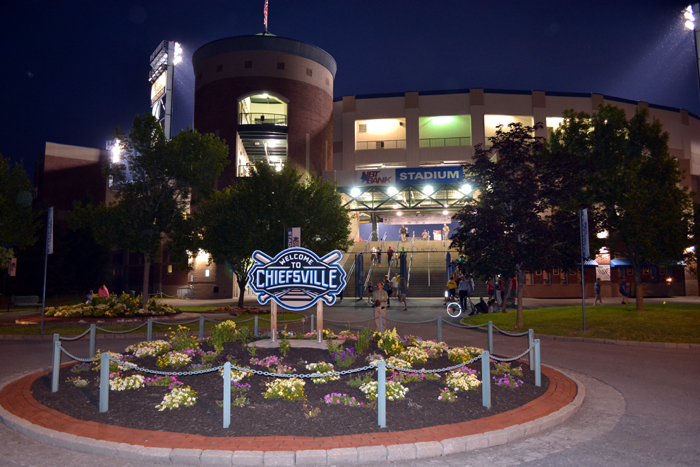 Just before midnight the night before, Chiefs assistant GM Jason Horbal had sent me a tweet saying to have someone in the reception area call him when I got to the ballpark so we could catch up. I’d also met Syracuse.com sports reporter Lindsay Kramer during my Monday visit, and he wanted to meet up to interview me for a story he was going to write about my visit. Man, I never need any extra incentive to get to the ballpark, but I certainly had it on day #2 and couldn’t wait to get to the park. … before he reappeared and I followed him to his office. I didn’t take any photos of his office because, hey, that’s his personal space. But I can tell you that it was amazing — practically a Chiefs/baseball memorabilia museum. Signed balls, game-used bats, random baseball stuff everywhere and a cool picture of Bryce Harper wearing his Chiefs uniform above the desk. 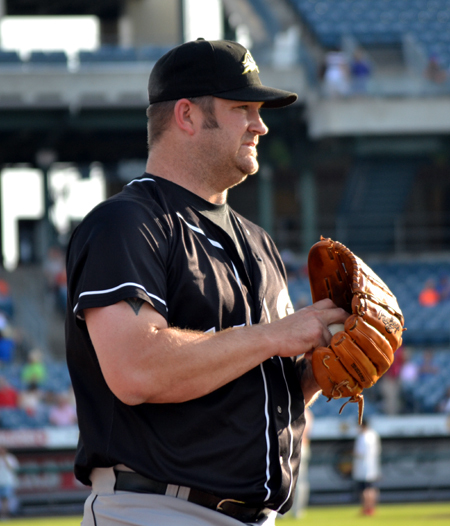 We talked baseball for probably half an hour and I was at my baseball nerdiest, asking Jason a million questions about behind-the-scenes stuff that goes on with an MiLB franchise. 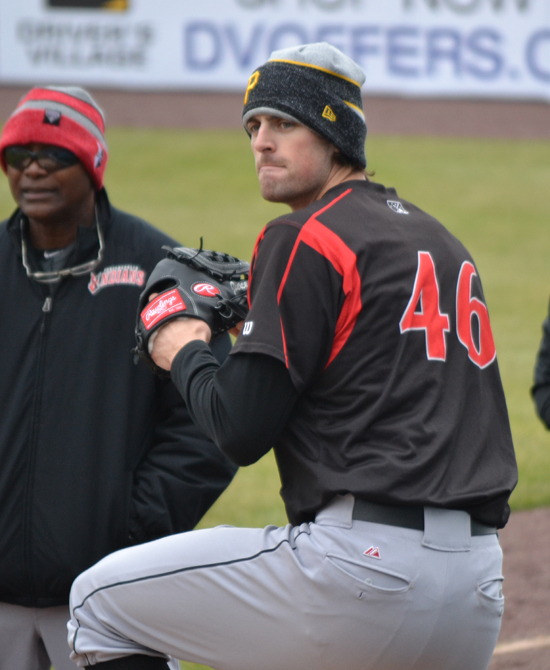 I heard stories about the recent Dwight Gooden and Lenny Dykstra autograph appearance at NBT Bank Stadium, Nick Swisher’s visit during a rehab stint in May and a whole lot more. Jason’s a great guy. Give him a follow on Twitter and if you’re at a Chiefs game, look for him in the concourse and say hello. 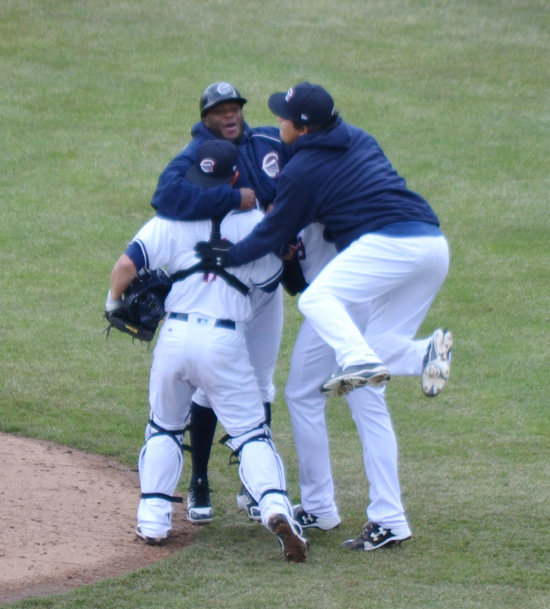 From left to right, that’s pitcher Zach Phillips with the sack on his head, pitcher Maikel Cleto and, I think, a member of the training/conditioning staff, although I could be incorrect. 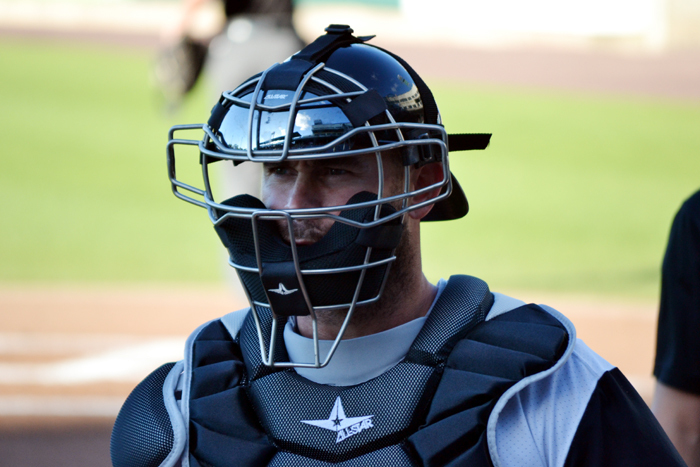 Incidentally, Phillips was one of the Knights I saw several times in the hotel lobby over the course of my stay. 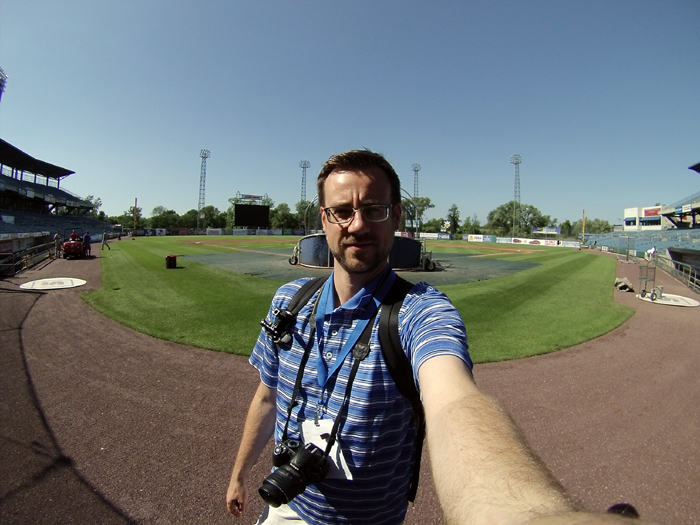 Although I took a bunch of photos, I was trying to remain as stationary as possible for much of BP, as I once again had my new GoPro strapped to my chest. I took some cool footage of the experience that I’ll be uploading onto my YouTube channel very soon. If you subscribe, you’ll be the first to know when it’s live! 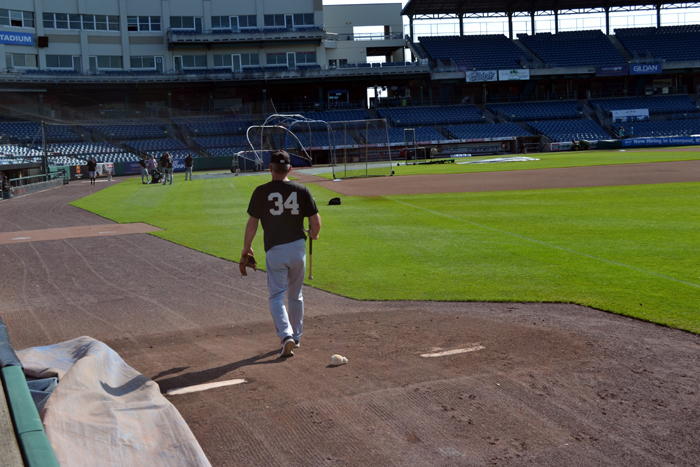 It was an absolute blast watching BP from the field. 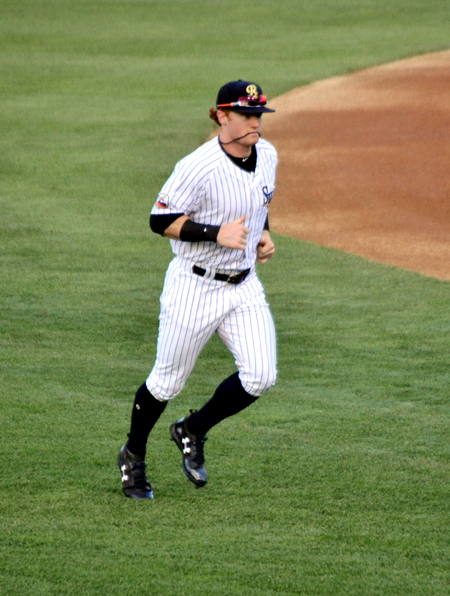 I’d done it once before, when a guy named Jeter was rehabbing in Triple-A, and this time was awesome, too. 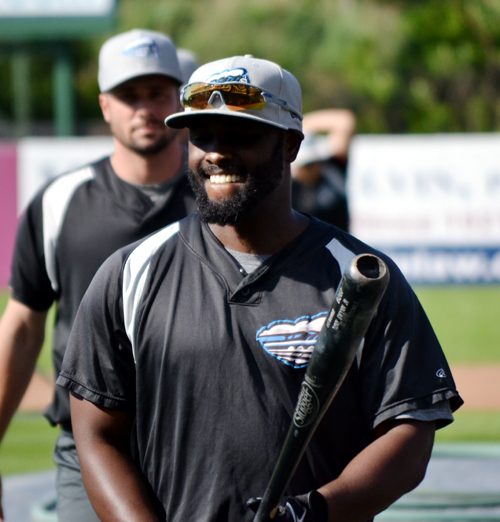 If you read my blog regularly, you know how much I enjoy the batting practice experience in the minors, so watching it from just a handful of feet away on Jason’s recommendation was outstanding. Thanks again, Jay! 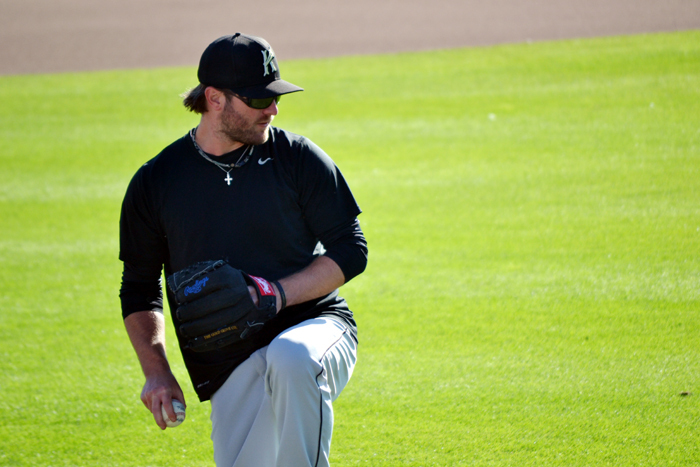 I also saw Brad Penny playing catch a day after his start. 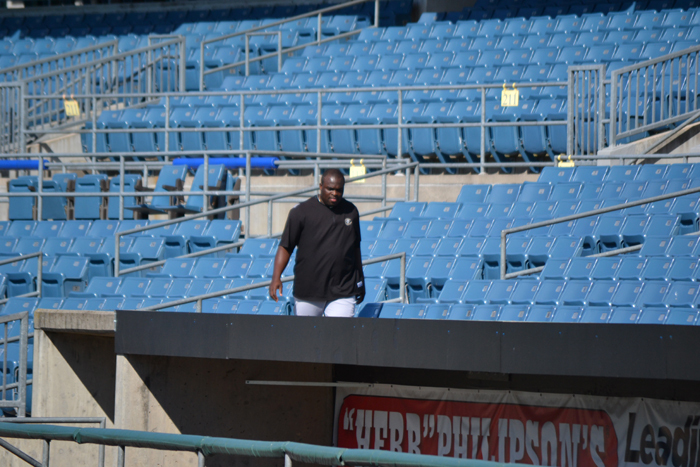 Even cooler, I noticed Penny running the stadium stairs when I first went out to the field. Pretty cool to see a a 37-year-old pitcher who has made nearly $50 million in his career working so hard to get back to the majors. Time to eat? I think so! They were tasty. 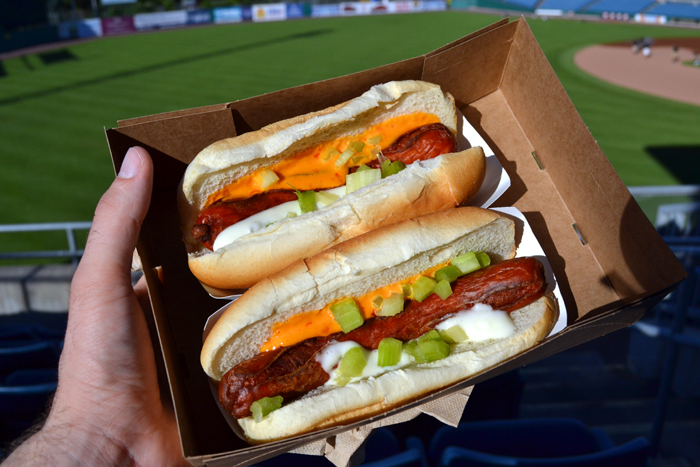 I’m not sure that they were the best ballpark hot dogs that I’ve eaten, but they were certainly among the most creatively designed. The combination of the hot sauce and blue cheese sauce was very chicken wing-esque, and the crunch from the celery was good. 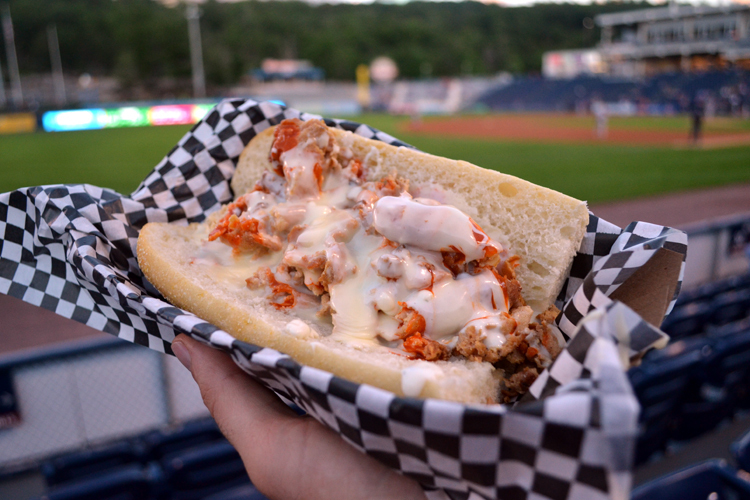 If you’re at NBT Bank Stadium this summer, I definitely recommend checking them out at the Chicken Fry Fry stand on the first base side. 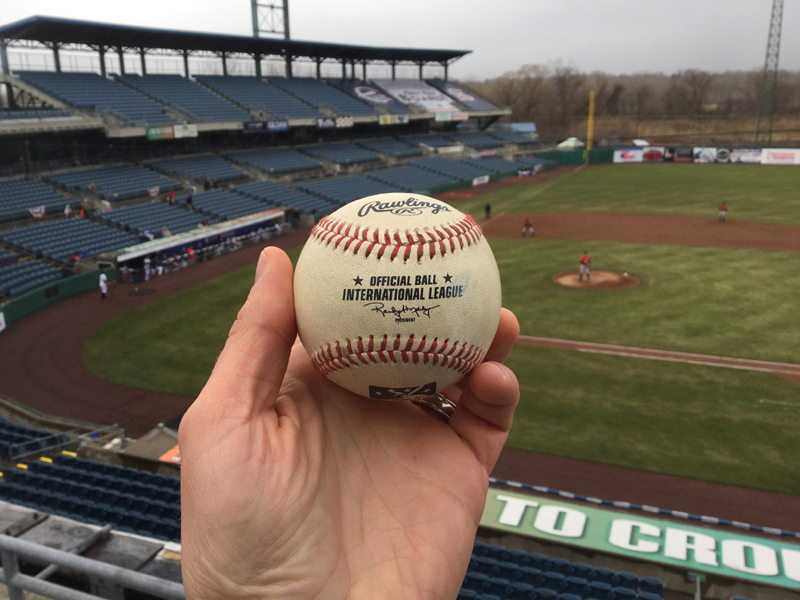 Funny story about this ball: It landed half a section to my right and a few rows above me, but I got there quickly and grabbed it. There was a kid a couple sections to my left who started running in the general direction of the foul, but he wasn’t even close to entering the section by the time I’d grabbed the ball. A handful of fans in that area booed loudly once I picked up the ball, apparently since I hadn’t chosen to ignore the ball so the kid could grab it. Not because of the booing, I decided right then and there that I’d quickly take a photo of the ball and then walk over and hand it to the kid. As I took the above photo, I noticed who I presumed to be the kid’s father waving his arms to encourage people to continue booing. Hmmm. That was enough of an incentive to convince me to keep it myself. 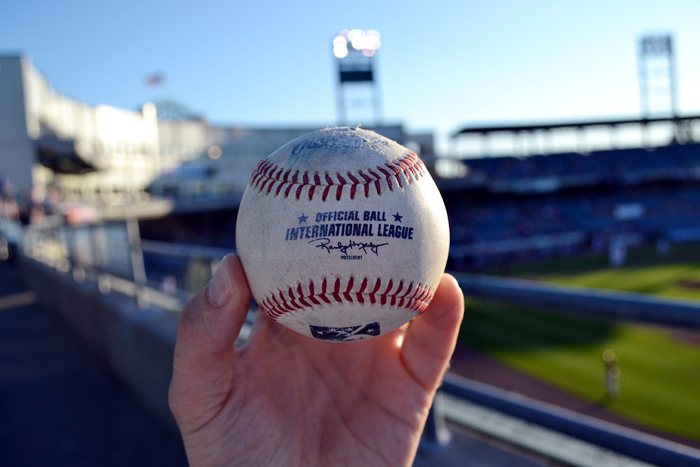 This is the seventh foul ball in my collection. One day, I’ll have to write a post about all of them. 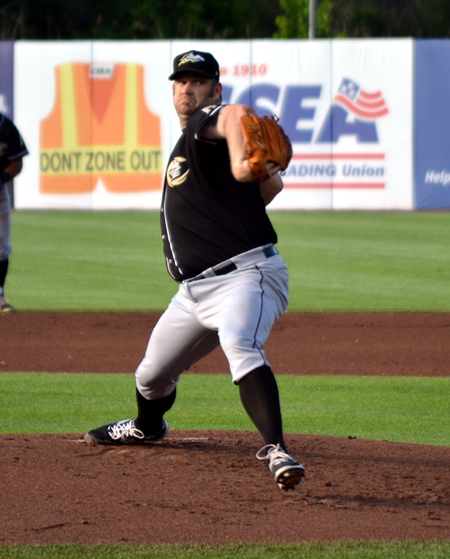 That’s former MLB pitcher Jose Valverde on the mound for Syracuse. 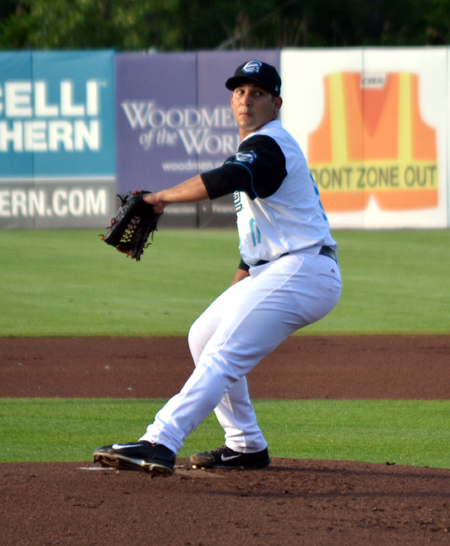 He pitched the ninth inning and picked up the save as the Chiefs won 4-3. It was hilarious to watch his disregard for the new pitch clock that’s made headlines throughout baseball in 2015. Simply put, he cares zero percent about it. I was actually laughing out loud a few times. 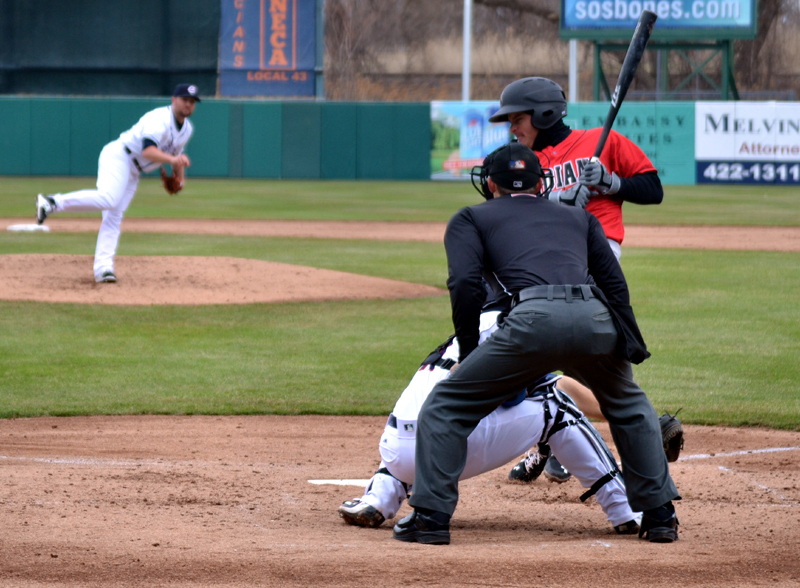 I believe the clock begins its 20-second countdown when the pitcher either receives the ball back from the catcher or steps onto the mound dirt between hitters. In any case, there were plenty of times that the entire 20 seconds had wound down long before Valverde had even taken the rubber. He never got a warning for it, either, so it was a funny game within a game to watch. 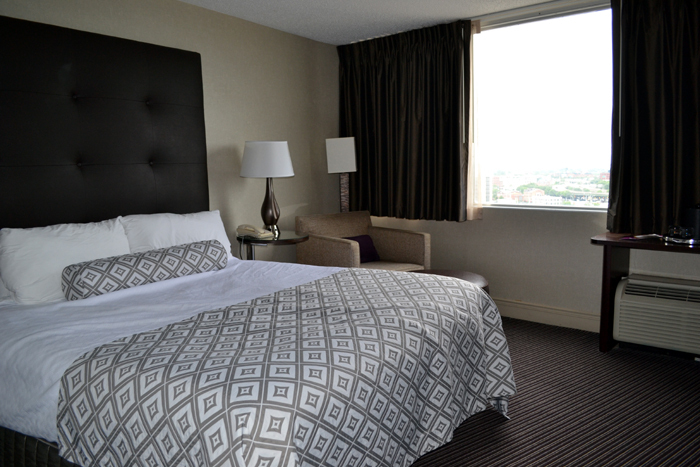 I don’t know when I’ll visit Syracuse next, but I do definitely know that the Crowne Plaza is where I’ll stay. 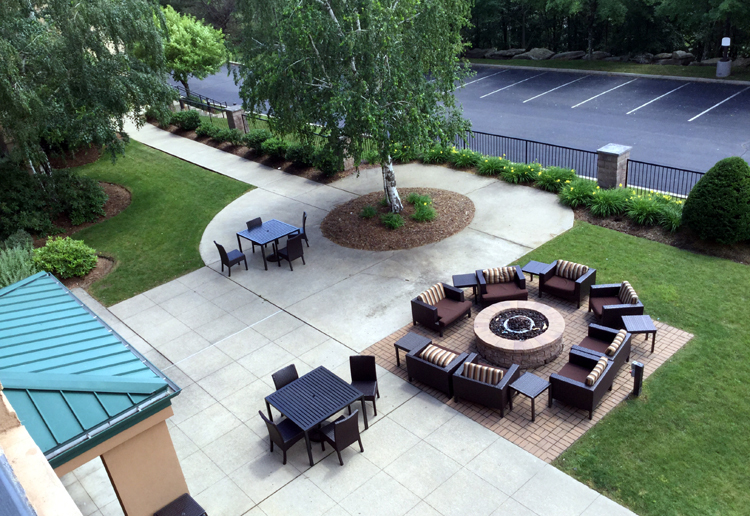 I was thoroughly impressed with every element of this visit, from the location of the hotel to the in-room amenities to the professionalism and friendliness of every staff member I encountered. 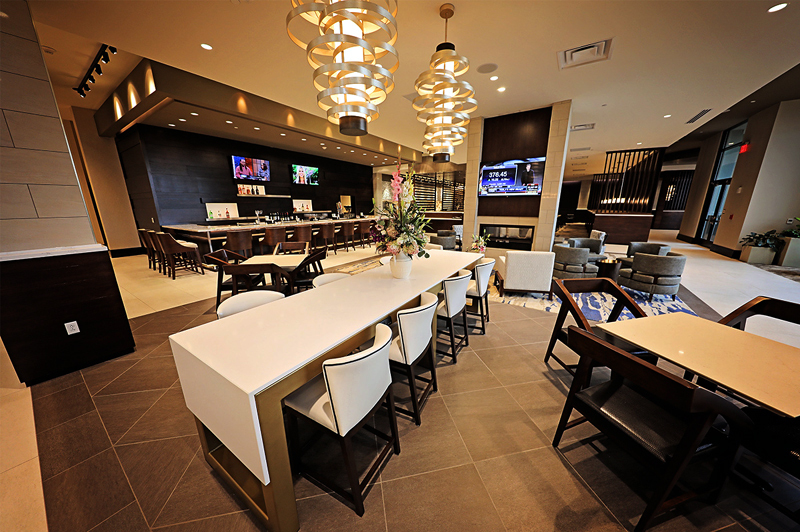 If you’re a baseball fan visiting the city — or are just visiting the ‘Cuse for any reason, really — I wholeheartedly recommend this hotel. After taking these photos, I packed up my camera for good and began the short drive home after an outstanding few days. I’ll be announcing my next travel plans very soon, so please keep an eye on this blog for details. Thanks for reading! I’ve never been good at math. But the reason that I got up on Monday at 5 a.m. for a 7 p.m. baseball game in a city located three hours away wasn’t due to poor math skills. Rather, it was simply due to a love of the game. For me, there’s absolutely nothing better than watching live baseball and it’s tough to get much sleep the night before a trip. Because I arrived about an hour before check-in, I had some time to kill, so I hung out in the lobby and did some people watching. 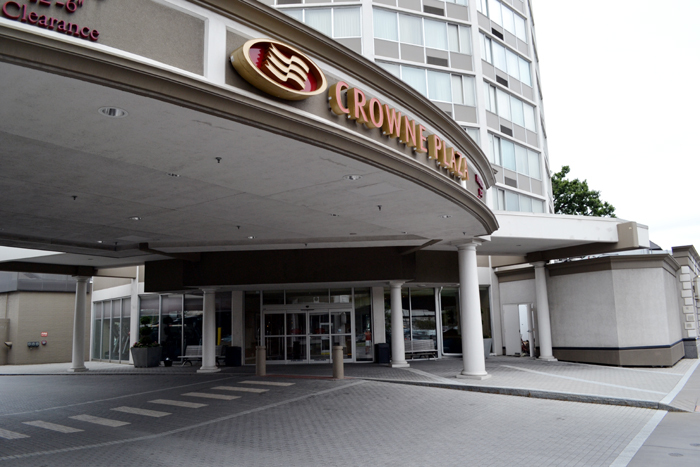 It proved exciting because the Crowne Plaza is the hotel that visiting International League clubs use! 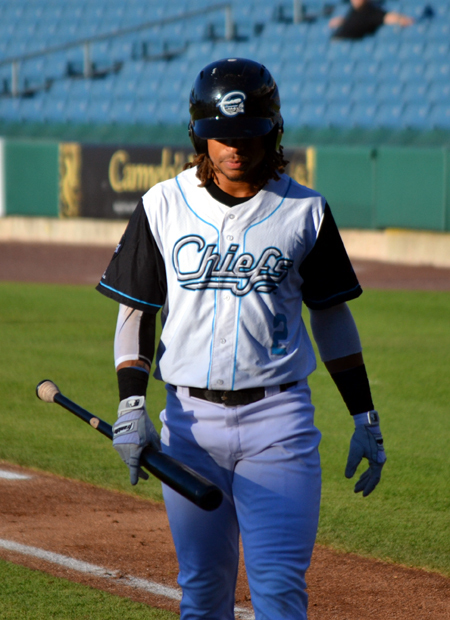 The Charlotte Knights were in town to square off against the Chiefs and the Knights players and staff members were coming and going the entire time that I sat in the lobby. 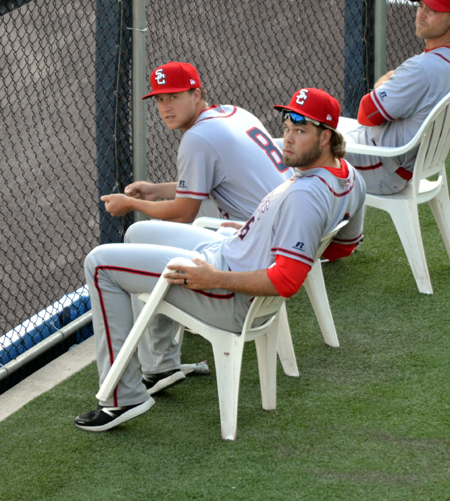 It’s pretty easy to spot ballplayers, and I’d estimate that I saw at least 15 players and coaches during the short time I sat there. 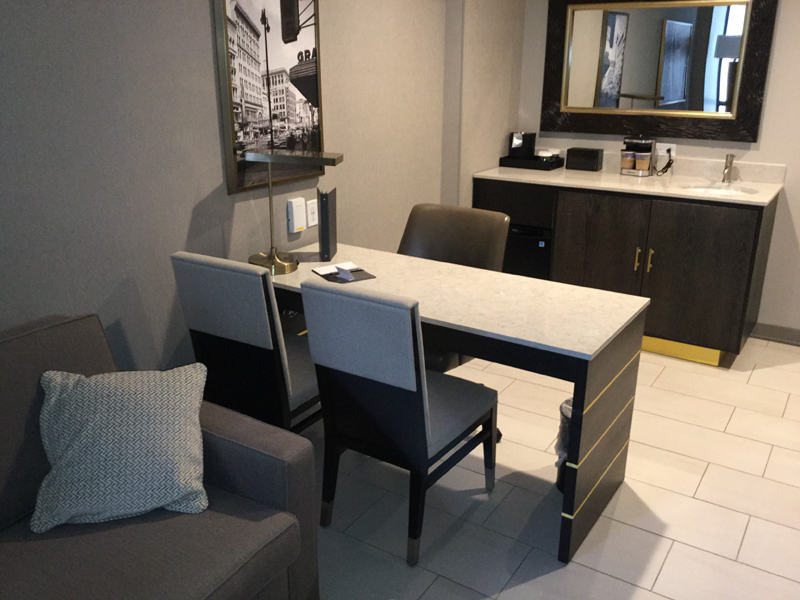 At one point, a Knights staffer approached the front desk with a rolling suitcase and asked if the hotel staff could keep the suitcase behind the desk for a player to pick up later. Apparently, he was on a different flight and wouldn’t arrive for a little while. The clerk asked who the luggage belonged to and I perked up my ears as the staffer replied “Chris Beck.” Beck was a second-round pick of the Chicago White Sox in 2012 and has already pitched one game for the ChiSox this season. 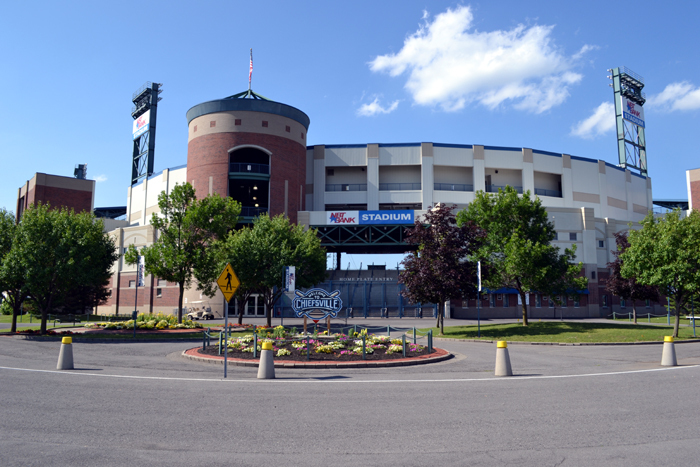 I didn’t have much time to enjoy the room just yet — I wanted to get over to NBT Bank Stadium good and early, because assistant GM Jason Horbal was providing me with a media pass. 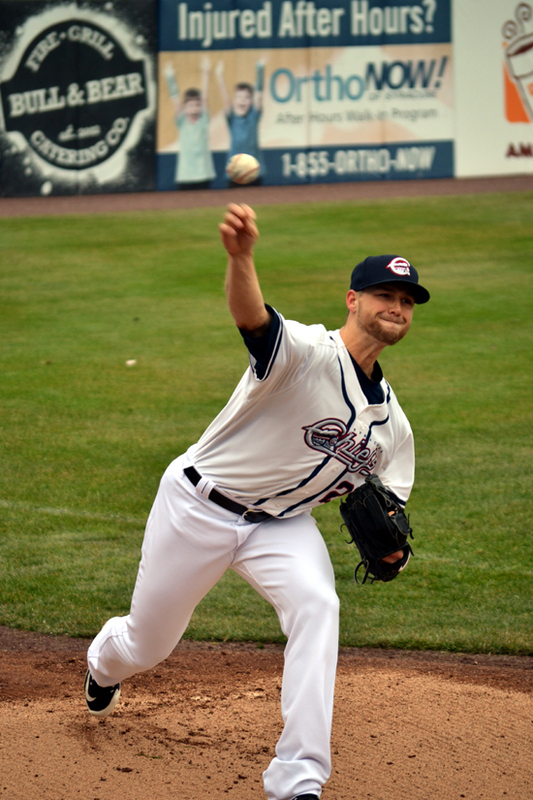 If you recognize his name, he’s the former GM of the Auburn Doubledays who give me the opportunity to throw out the first pitch at a game in July of 2013. 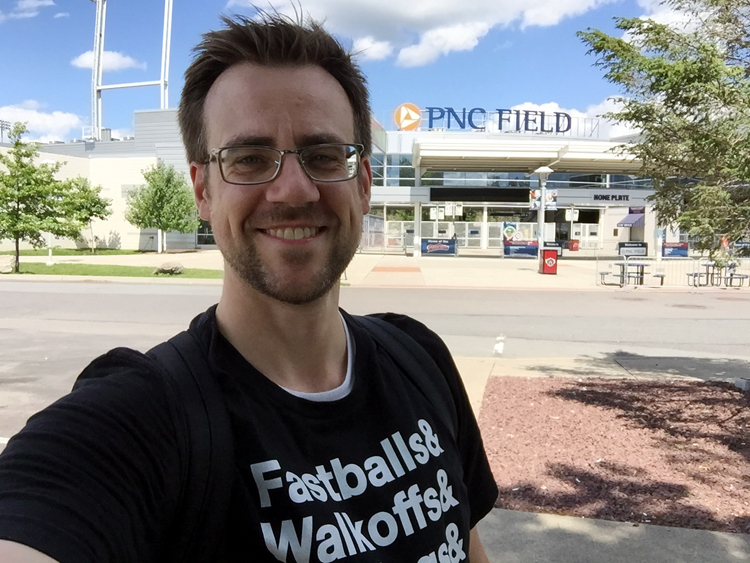 I was extra excited to get to the ballpark because I recently got a GoPro that I’ll be using to document my adventures on each trip. It’s going to take me a little time to edit all the footage I shot, but I can promise that I’ve got some cool stuff to share with you. 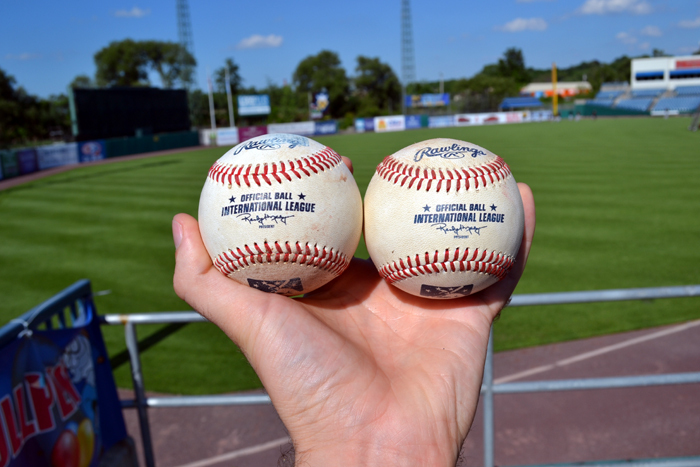 After I took this photo, I tossed these two International League balls into the Syracuse bullpen because I don’t think it’s fair to snag BP balls when the stadium isn’t yet open to fans. Still, they made for a fun picture, right? “Do you want to keep this ball?” he asked. “No, I’m good, thanks,” I replied. 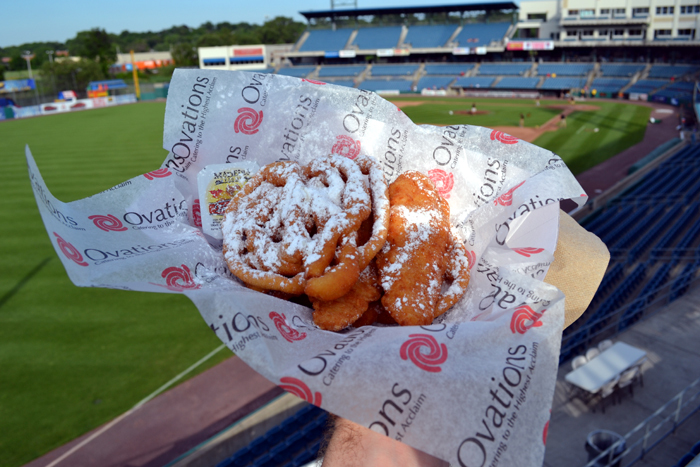 It included two large funnel cakes, three chicken tenders and a dusting of icing sugar with a side order of syrup. 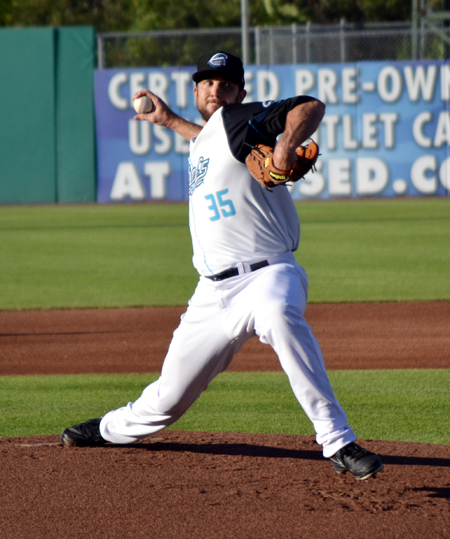 He’s a former Toronto Blue Jays draft pick, so I followed his early career when he was in the minors. He’s played for a handful of organizations, including two stints with Toronto, and is a guy who shows an unbelievable amount of hustle and is really a pleasure to watch and root for. 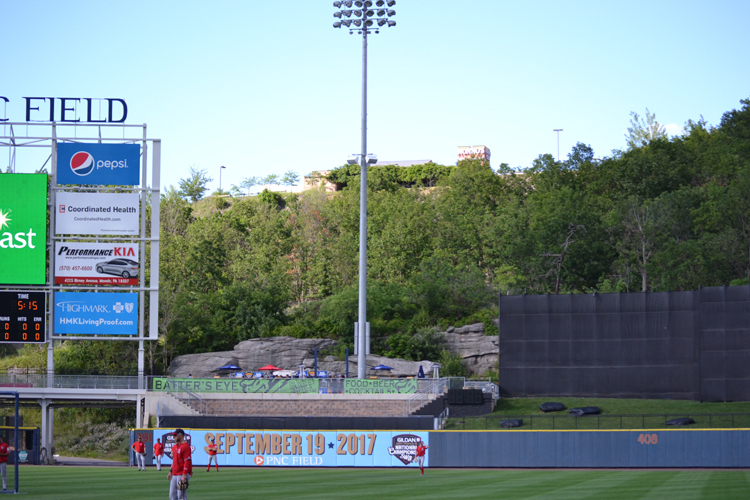 The Chiefs have a promotion in which you tweet about the game, hashtag #GannonChiefsBuzz and you might get your tweet featured on the screen. 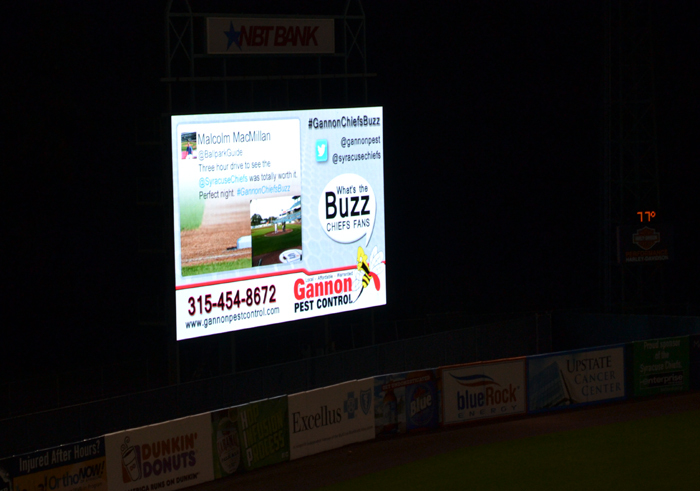 Well, mine was, and I think this is the first time my Twitter account has appeared on an MiLB video board! 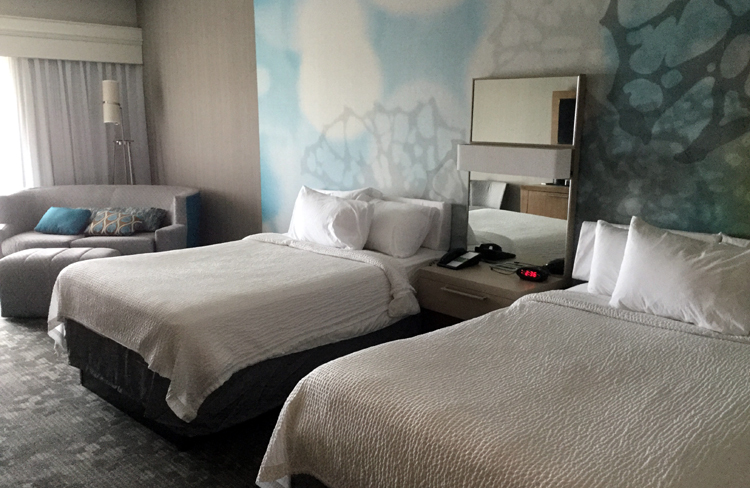 I’ll get into some of the other details about the hotel in my post about my second day in Syracuse, but let’s talk about the in-room amenities: 32-inch high-def TVs, free high-speed Internet and rain shower heads were my favorite amenities. 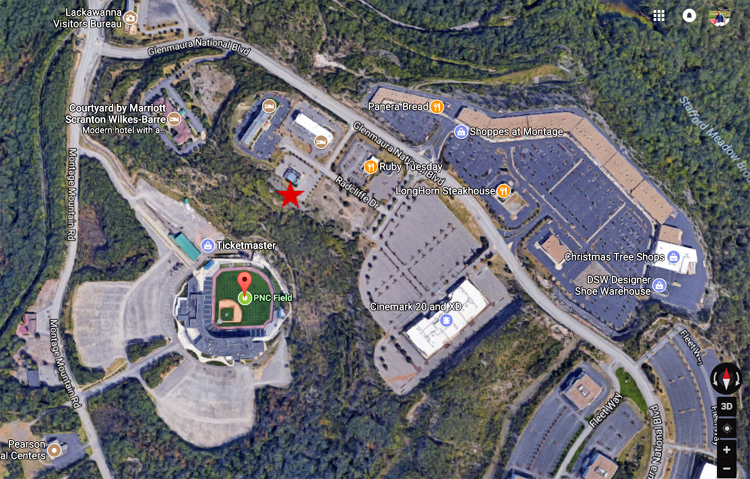 There’s plenty of on-site parking and the hotel is just a minute off the highway, making it really accessible. 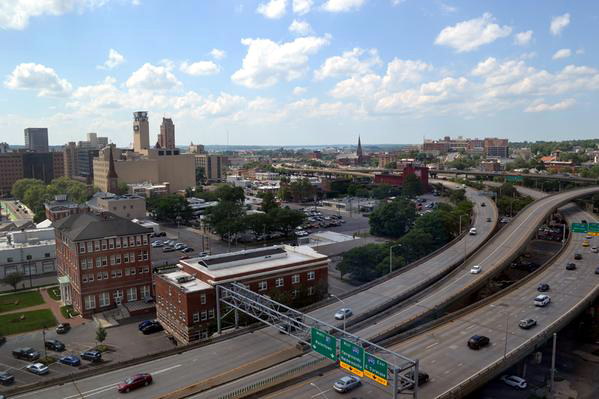 Between the guest room perks, the outstanding view, the short drive to NBT Bank Stadium and the opposing players you’ll see throughout the hotel, I definitely recommend the Crowne Plaza Syracuse when you’re visiting the city to see the Chiefs. 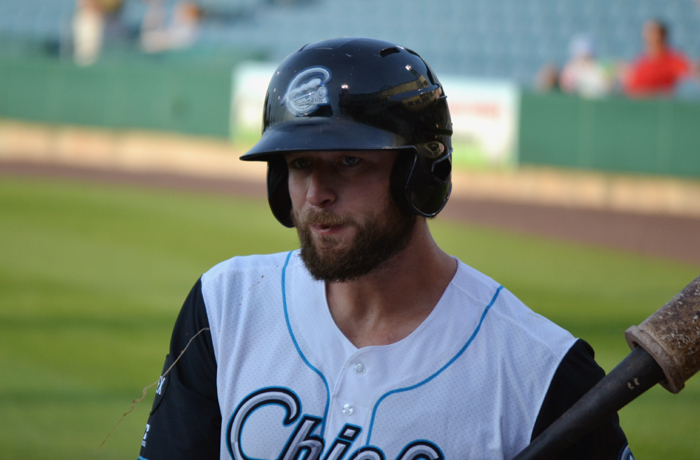 … to see the Triple-A Chiefs in action against the Charlotte Knights for games on Monday and Tuesday (June 22 and 23). 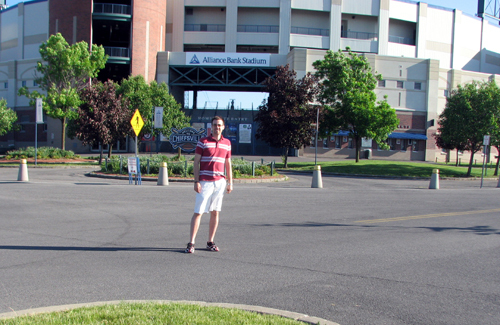 July 18, 2010: During my very first road trip for The Ballpark Guide, I saw the Chiefs in action and it was a perfect, sunny day. 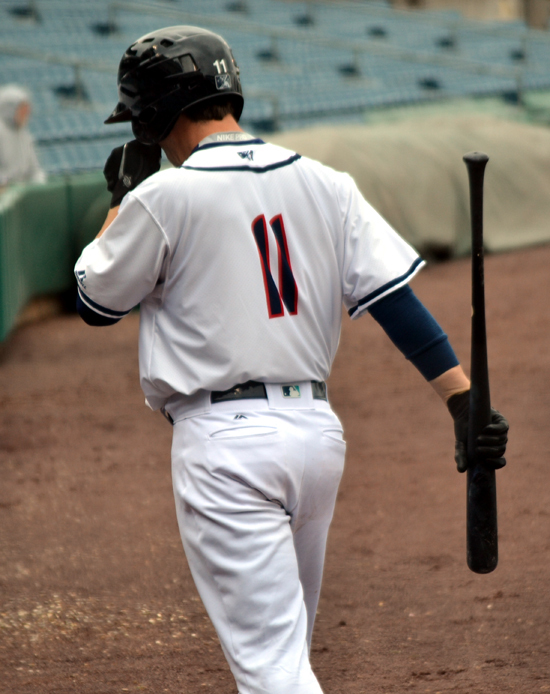 May 3, 2011: Rainout. 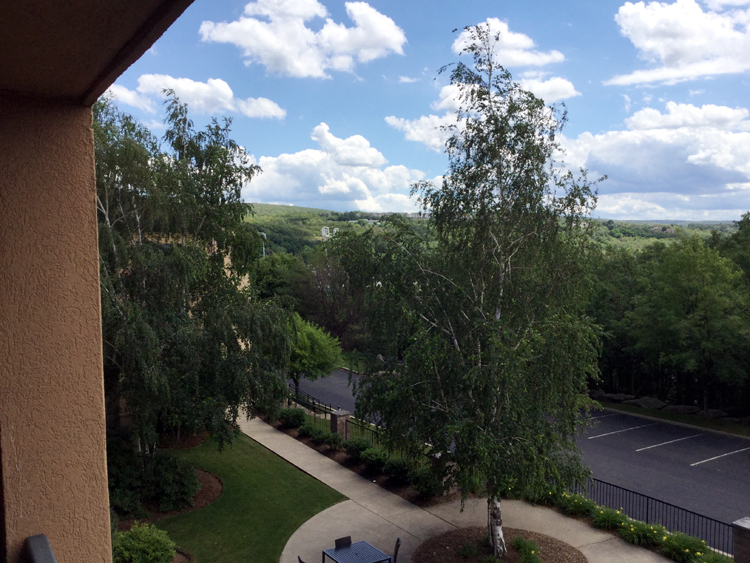 Drove three hours to Syracuse. Found out the game was cancelled. Drove three hours home. April 14, 2013: An amazing day! 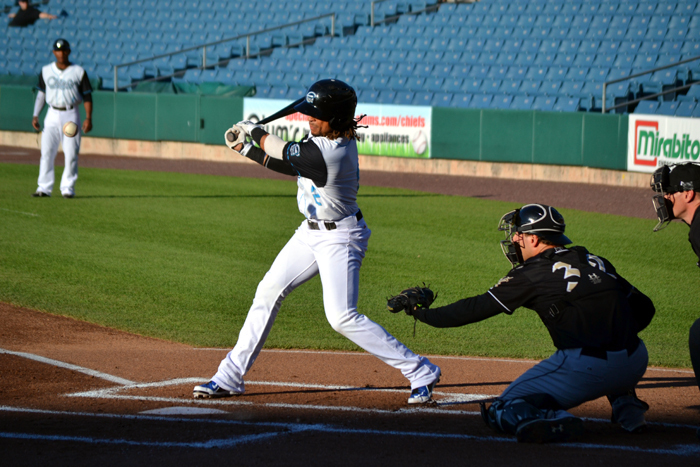 Watched a doubleheader against Lehigh Valley. 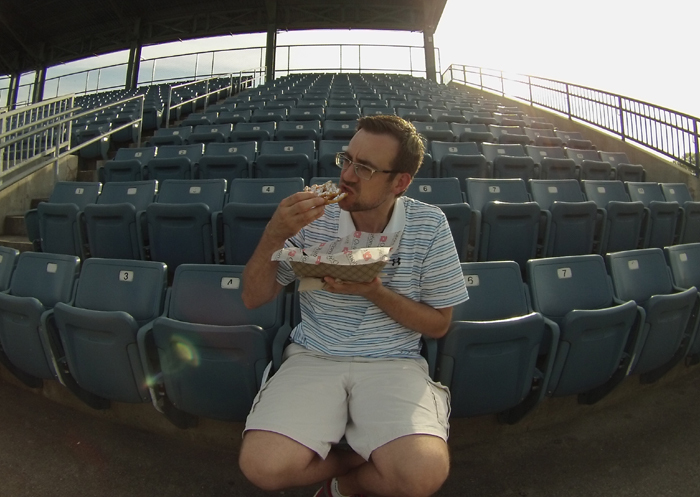 Awesome tour, tasty food and two foul balls. 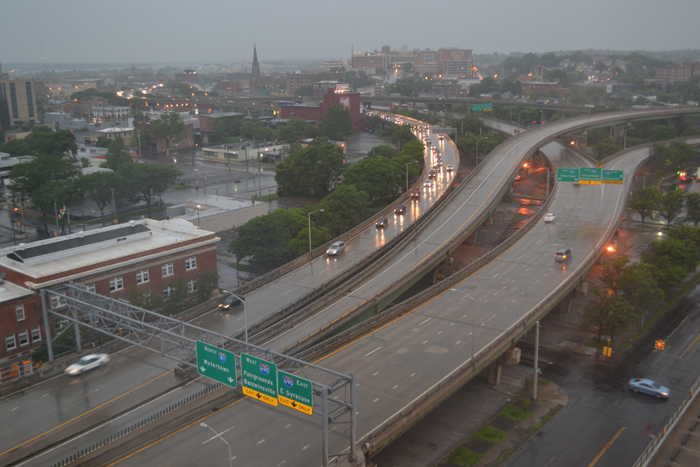 July 28, 2014: Rainout again. Drove three hours to Syracuse. Found out the game was cancelled. Drove three hours home. For starters, I’m obviously hoping for good weather for these two games. 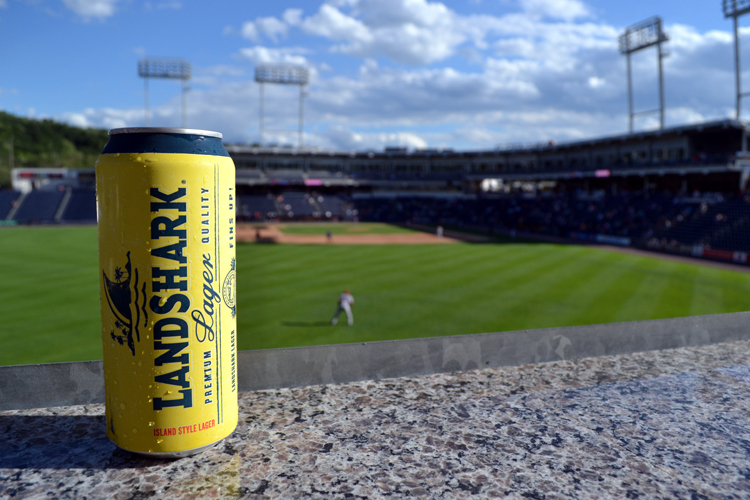 Beyond that, I’m just excited to be back at the ballpark. 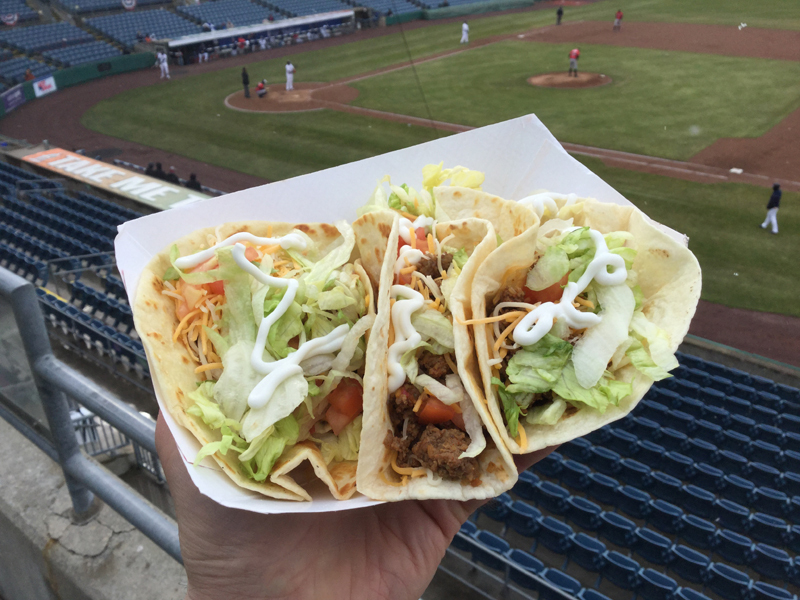 NBT Bank Stadium has an impressive list of new concession items for 2015, so I’ll definitely be giving some of them a try. 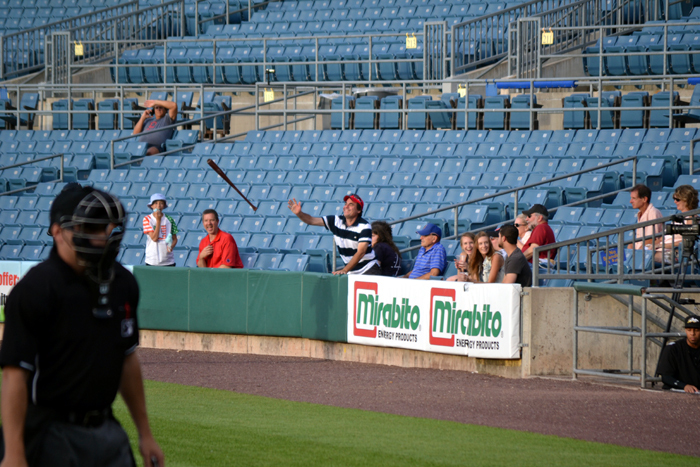 It might be nice to snag another foul ball or two, too. 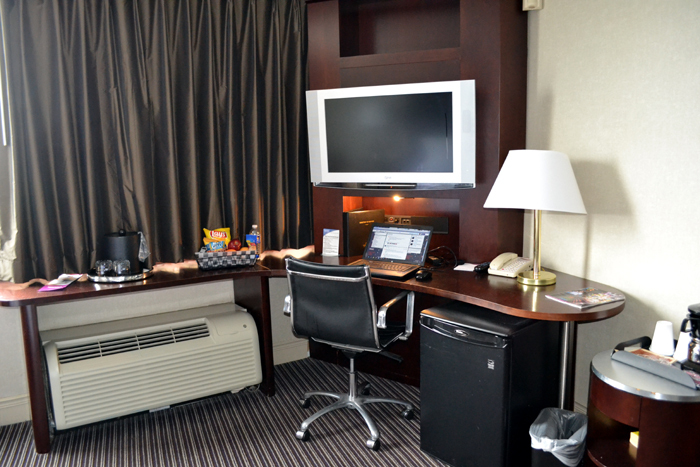 As usual, I’ll be tweeting and blogging along the way and can’t wait to share my adventures with you.